Our neighbor has had a little book box in his front yard for a few years, and happened to mention that he was thinking of replacing it with something larger. 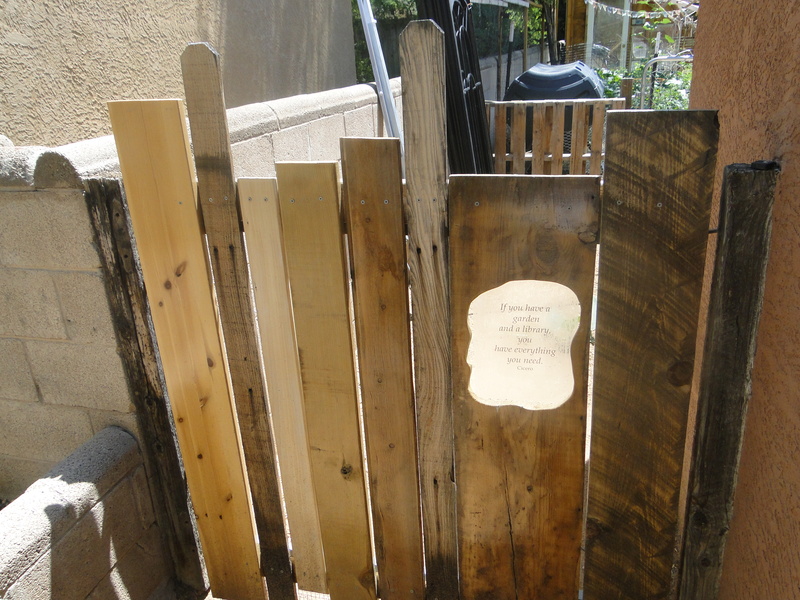 So Tina and I decided to take advantage of all the scrap wood we have from our demolished bookshelves and recycle them into something new. And we got started. The pieces we were working with were these long 1 X 10 boards that had been a set of ill-fitting bookshelves in our upstairs room; we’d pulled those out, and the wood had been sitting outside. So, we started building individual boxes, in various widths, all tall enough to fit a hardcover novel. As the boxes were finished Tina started painting them. The neighbor had the inspired idea of painting the boxes in a Mondrian theme. The curved roof promised to be a challenge. I cut the curve out of plywood and used some leftover 1 X2 to support the overhang. The neighbor couldn’t stand just watching us do all this so he came over to paint for a while. It was quite a bit of work to mask everything off and get those nice, clean lines on the side-by-side colors. I am grateful to be married to someone who doesn’t mind doing it. She has this magical ability to carefully do something and rush at the same time. After painting the boxes and getting the doors on, it was time to attach the roof. The doors were fun; I had never worked with plastic before, and was pleased to see they had the plastic and some great screws for attaching it right down the street at Ace Hardware, along with those little thingamabobs that hold the door shut when you close it, the sort of thing one would use in a cabinet. Doors are always a bit of a miracle: when you screw the hinges and the closures on and the thing swings shut, stays shut and isn’t crooked…it’s just amazing. The roof is a piece of duct material from the Re-Store, a place that sells unused, scrap, and used building material for Habitat for Humanity. 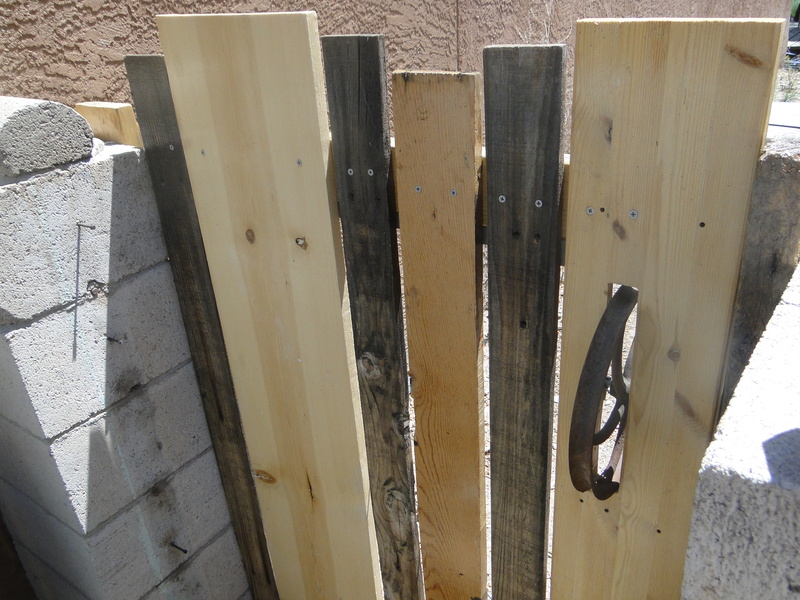 I cut out the corners, folded them over by clamping a 1 X 2 along the length and bending it with pliers, then beat the edges down with a rubber mallet. I had to beat the corners with a hammer to get the little sharp bits flattened. The final step was screwing and bolting the boxes onto the support pole, which is the same one that was holding the old book box. It was hard because we couldn’t fit the drill into the boxes, so it had to be done by hand. Now we just need to fill it up! In the upper picture you can see a section of the mesa where a lot of debris has slid down the side; I thought this would be our route to the top, but the trail actually hooks way over to the east side of the mesa before heading steeply up. 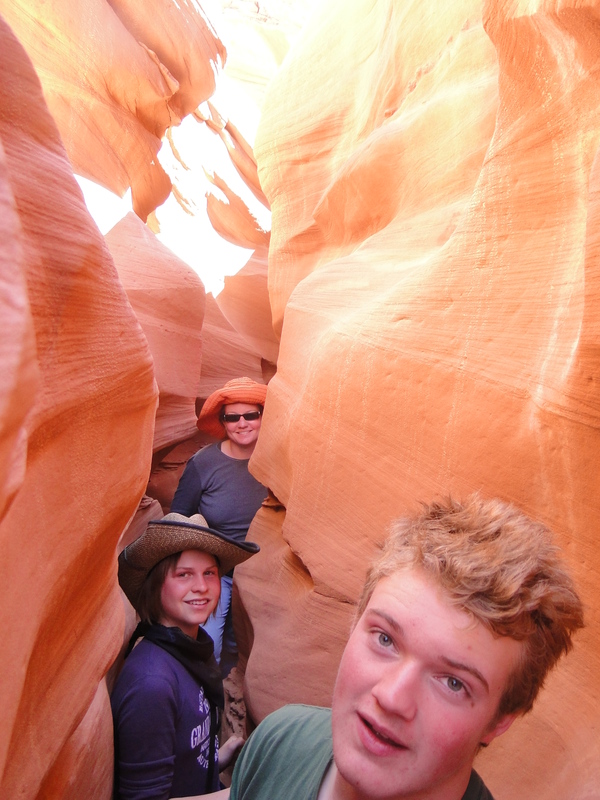 The top had a lot of exposed sandstone, with rugged trees trying to take root. After the hike we were hungry, so we drove the few remaining miles to Cuba and had not-too-bad barbecue sandwiches at a little drive thru in town. A great way to spend a spring day! …or it is trying to. 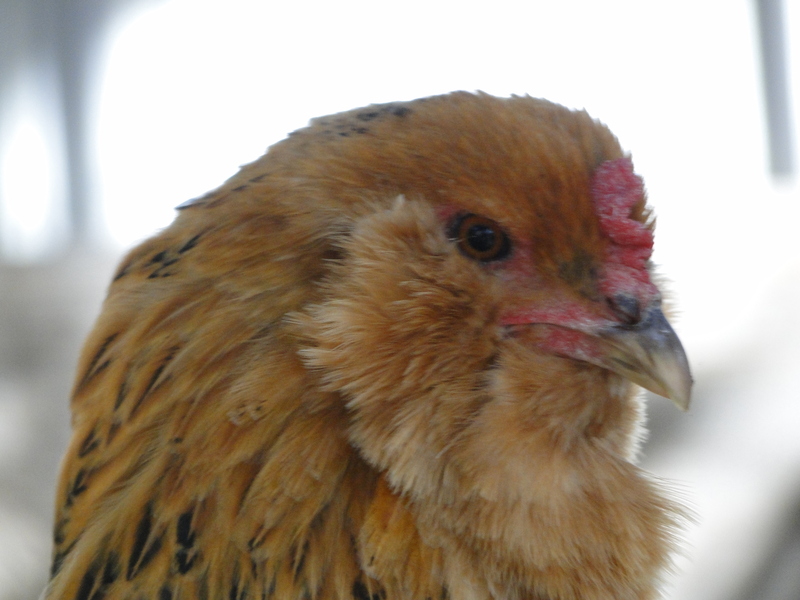 This morning it was just a hair above freezing (cold enough that there was a thin film of ice on the chickens’ water, but warm enough that the apple blossoms were not harmed); I opened the door to go outside and ran back in to get my (Tottenham Hotspur) sweatshirt. By time-to-walk-the-dog time, I could leave the sweatshirt at home. Now it is 4:00 and clouds have rolled in from somewhere, and it is windy and chilly. I took a census of the birdhouses. 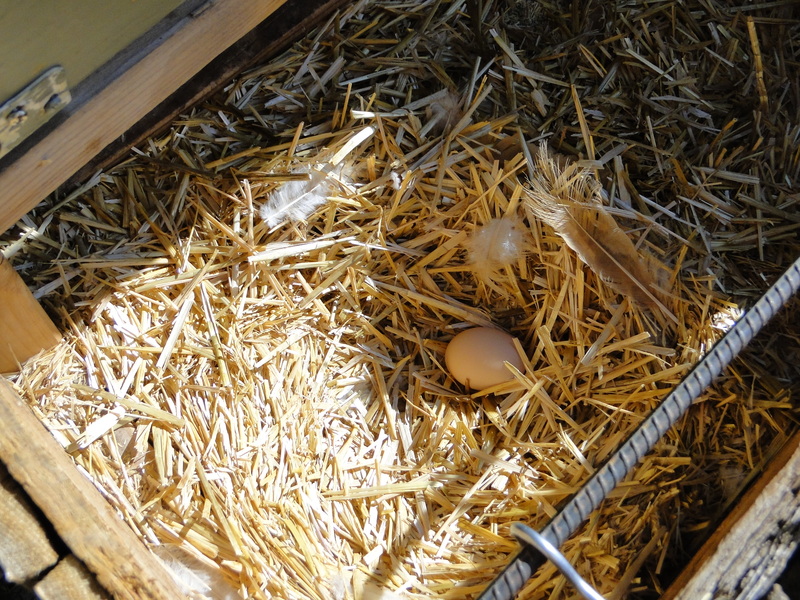 The result: 4 out of 6 occupied. 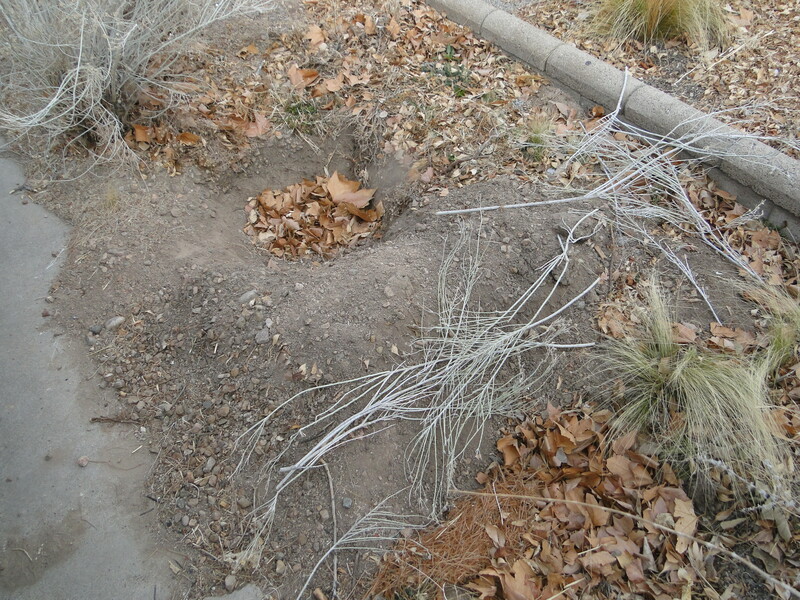 Someone is living here, based on the nesting material oozing out the doorway, but I am not sure who. However, a woodpecker was hammering away on the outside of the house- either driving the resident nuts or doing some work on the place, I’m not sure. Now that I see this picture close-up, I bet the sparrow in the background is the one living in the house! I’m not sure who lives in this next one; this male sparrow has been spending a lot time here, sitting close to it, going in and out. I’m wondering if maybe he is hoping to entice a female to join him there. You can see him sticking his head out the side door. 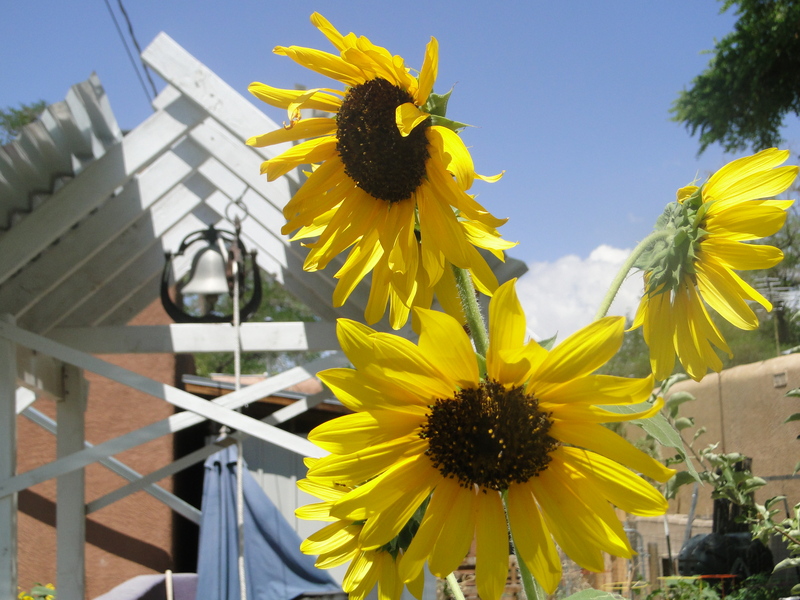 Of the two in the backyard, one has sparrows (though once it had…wait for it…owls! ), and the other seems to have nothing. I’ve also experimented with building some kind of bird-something. 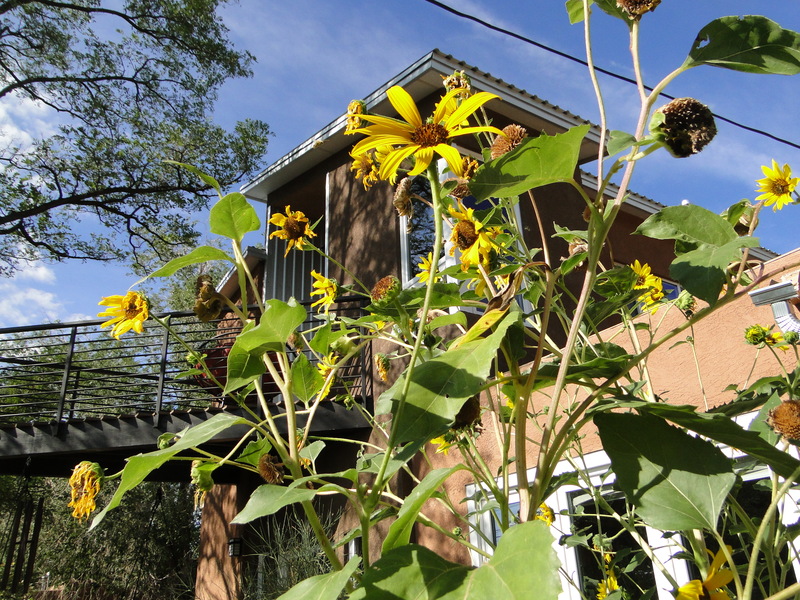 It’s not exactly a house, but rather a bird-enticement. Bird houses are built for cavity nesting birds, but I hope this one will charm a build-it-on-the-branch sort to call it home. Specifically, I want Western Tanagers to move in. This will not happen. Still got their fuzzies on. 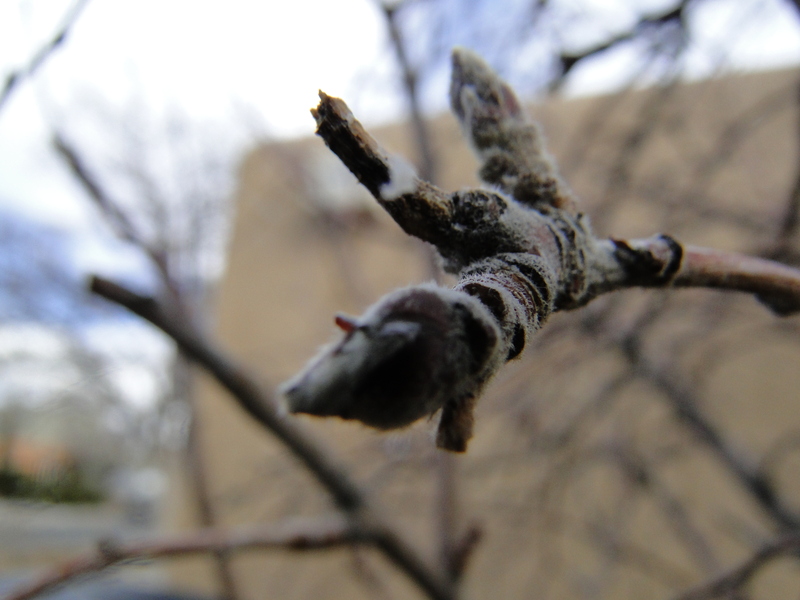 And that’s what Spring has sprung upon us so far, at least where birdhouses and Granny Smith apples are concerned. Stay tuned for photos when the Tanagers move in. I say pretty sure because me and pears have a checkered past. 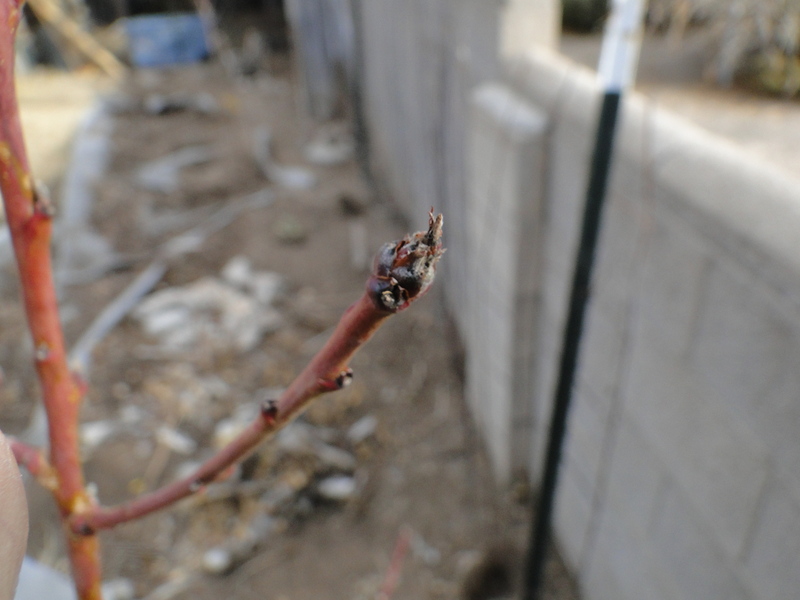 I got my two pear trees around 5 years ago, and specifically chose Asian Pears over European ones because the Asian ones ripen on the tree, and the European ones have to be picked first to ripen on the counter, which sounds more complicated. In the end perhaps I should have purchased North American Pears, which do not exist, because the pears have been troublesome. 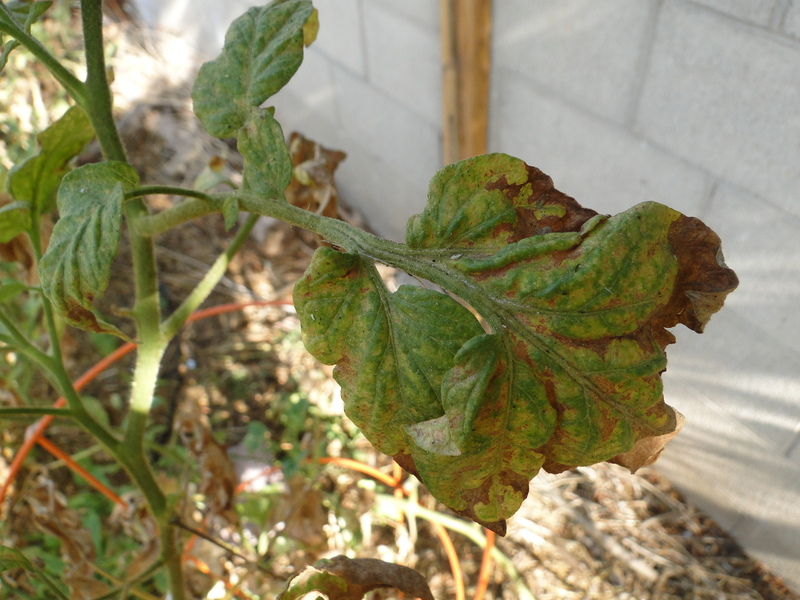 They hated the soil, and every year after that first one spent the whole season turning yellow, then brown, showing all the signs of iron deficiency. I tried various techniques to correct the soil (adding iron, adding sulfur so the plant could get to the iron) to no avail. 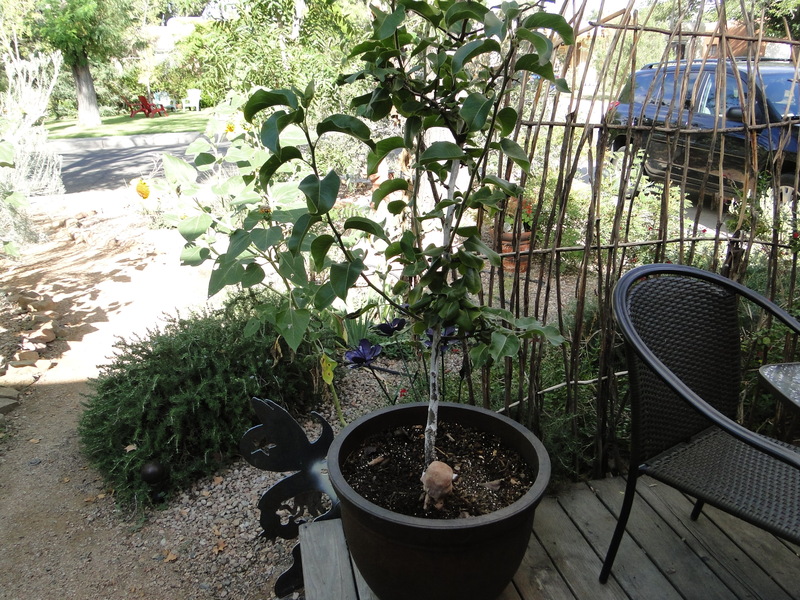 This season I moved them in to big pots to make room for a plum tree, figuring if they survived, whatever, but otherwise enough is enough. …well. It may or may not be ripe. I’ve been very sheltered as far as pears are concerned. Most of my experience has been the canned variety. This is decidedly crunchy, but sweet, except the skin is bitter. I’ll eat the other one next week and see if it is any different. 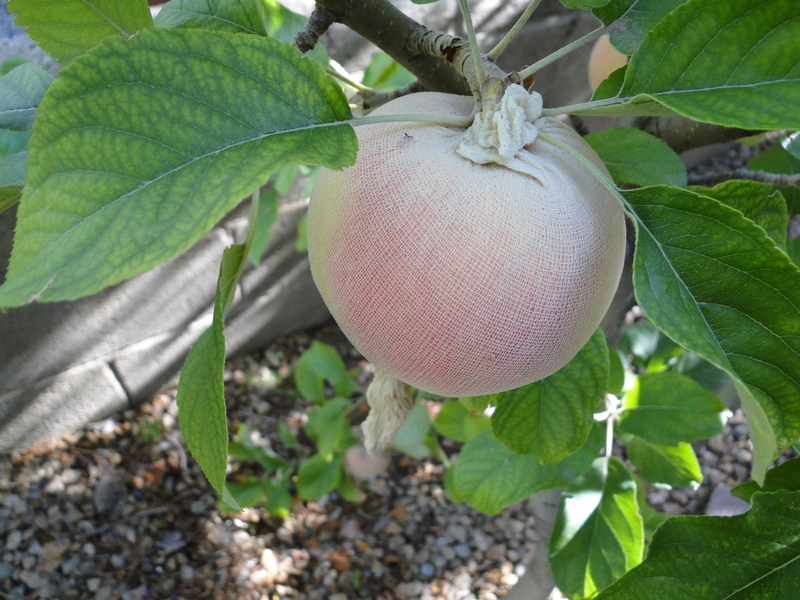 Still a few months until the apples are ready, though the hints are there- see the faint blush of red? 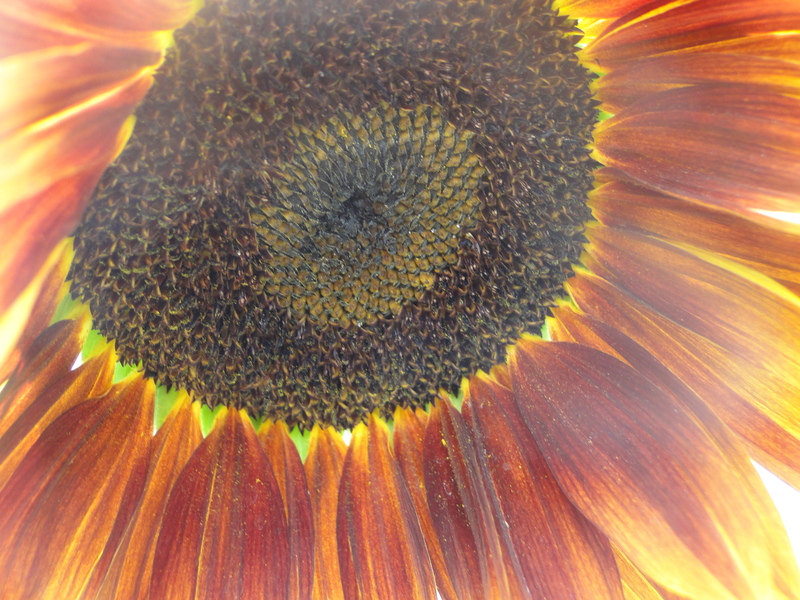 The above is the ‘Cinnamon Spice’ variety, which ends up very red, so this still has a long way to go. 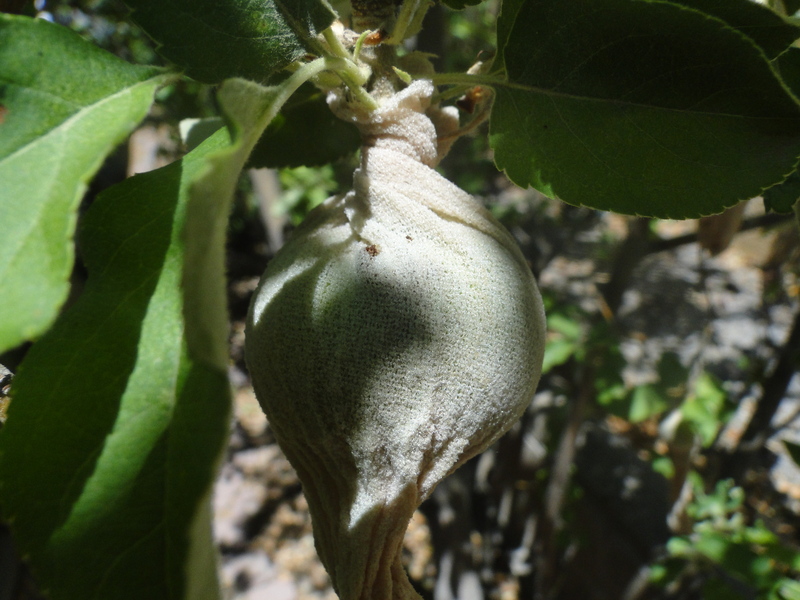 And no, this apple is not naturally covered with a gridlike skin. 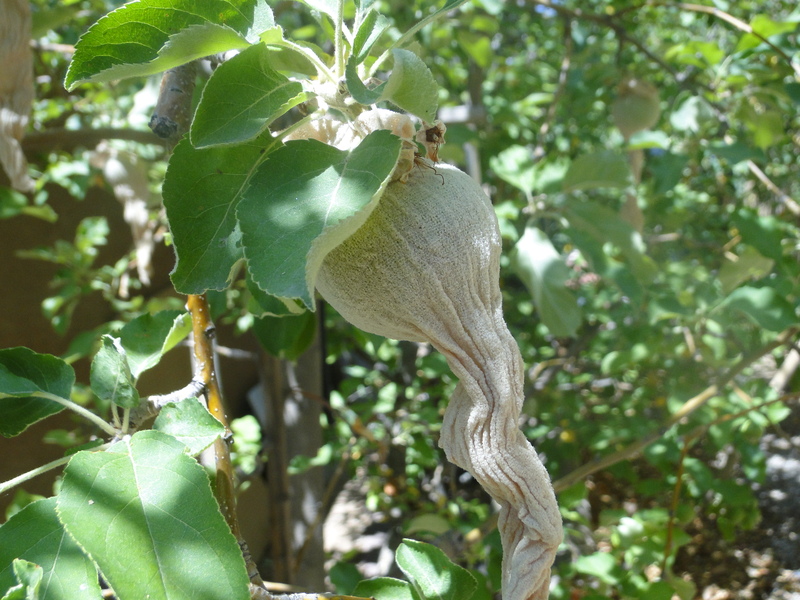 That is the nylon apple sock (for keeping codling moth larvae away), which has managed to expand very nicely to suit the growing apple without slipping off. The above is what we are trying to avoid. I had 144 apple socks (a ‘gross’); the rest remain exposed and will be used for pies and cider. A test comes soon. These socks go on after ‘June drop’, when the trees drop a lot of the little baby fruit on their own. There is also a big ‘September drop’ (in my orchard, anyway), where lots of not-quite-yet-ripe apples fall, and I’m waiting to see if the socks make an apple more or less likely to drop, or if it matters. 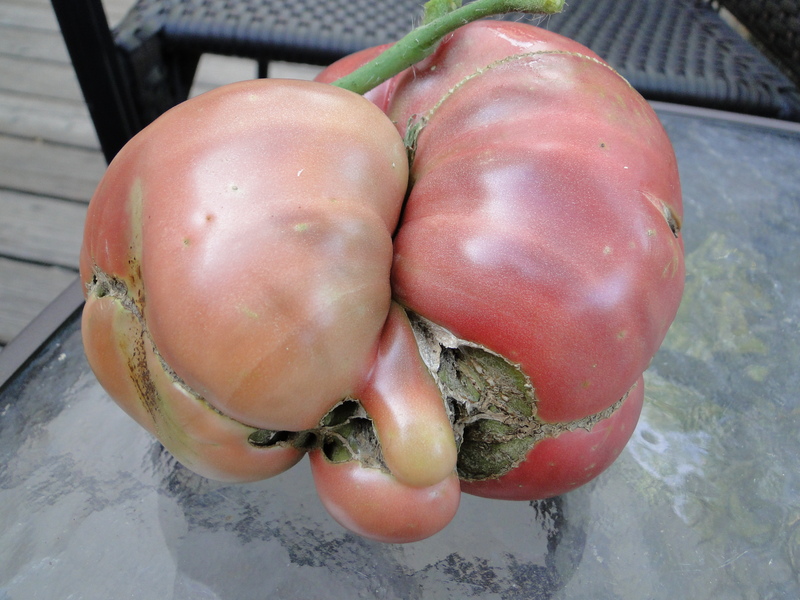 Behold the above: fungus on the tomatoes. After months and months of endless drought we had the ninth-wettest July ever (what a relief). This is good, but in exchange we get things like fungus and flies. We have chickens, so I worry about us having flies, but this year everyone has them much worse than usual, all over town. It’s a fair trade for the rain. 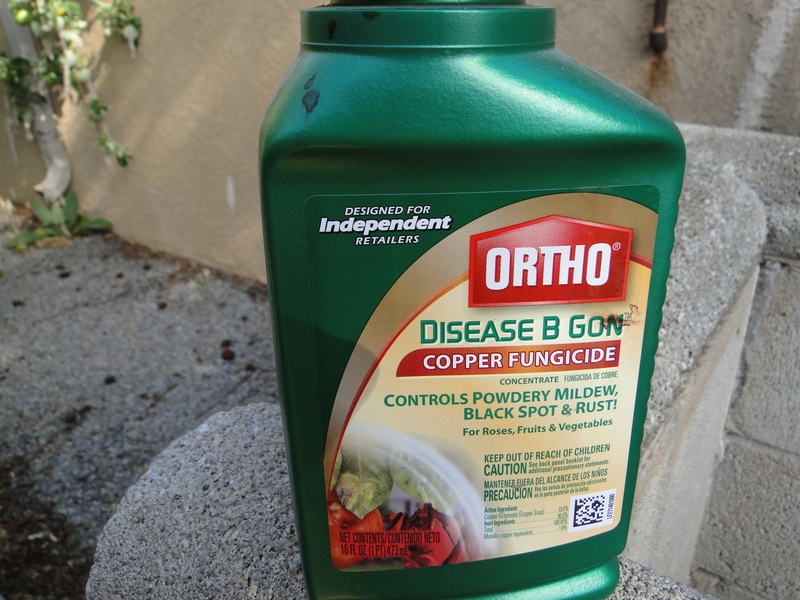 A buddy of mine who owns a nursery said I should be spraying copper on the tomatoes to defend against the fungus, so I am. It’s been just a week so far, so we will see if it helps. You gotta love the name ‘Disease B Gon’. Like something Wile E. Coyote would buy from ACME. 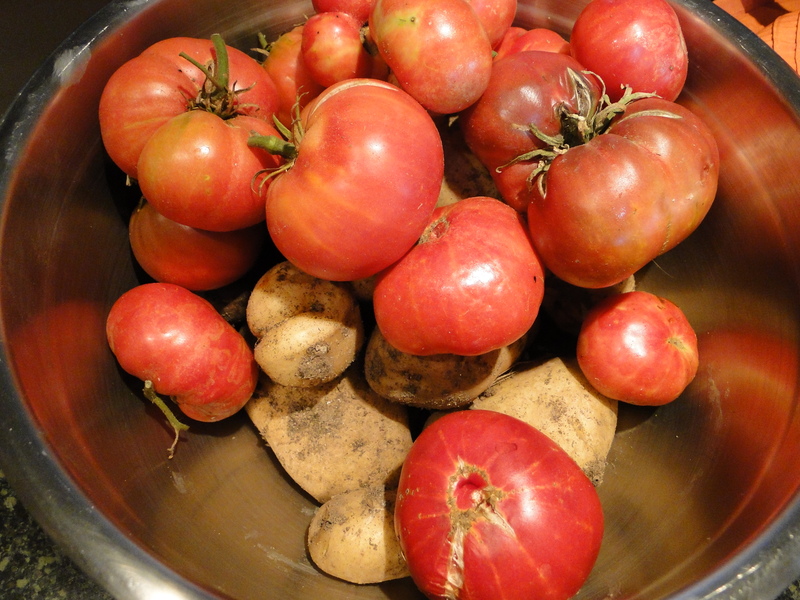 And, despite fungus, we’re getting lots of tomatoes and potatoes as well. 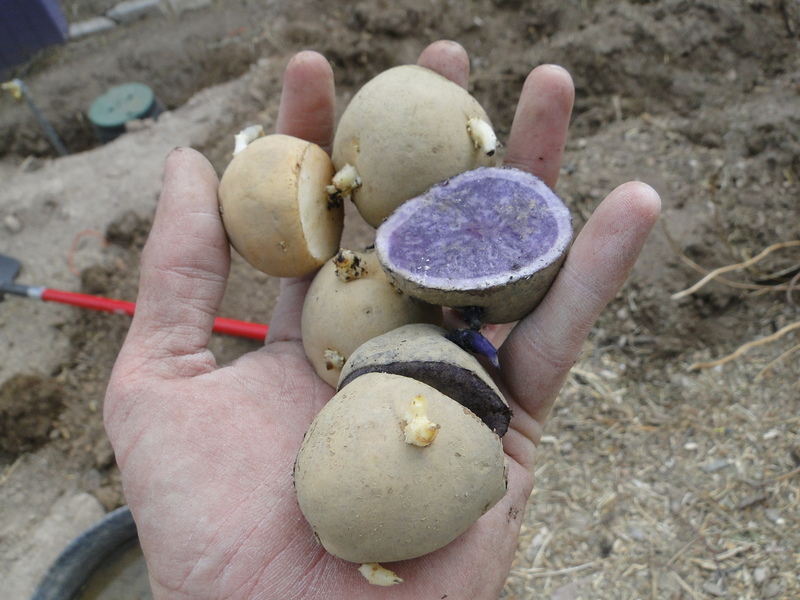 Incidentally, you really have to WASH potatoes to get them clean enough to eat. This morning’s hashbrowns were very tasty but a bit…grainy. Lesson learned. Pretty nice. 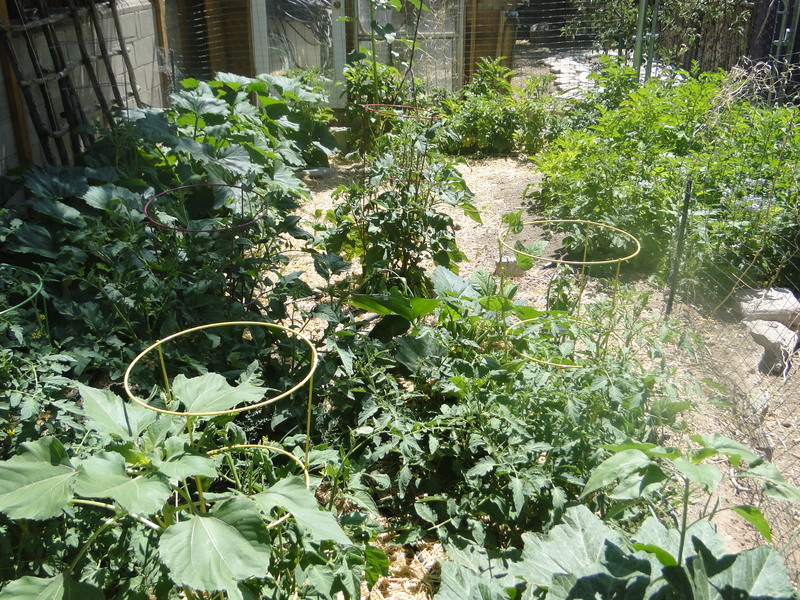 And no evidence of squash beetles. 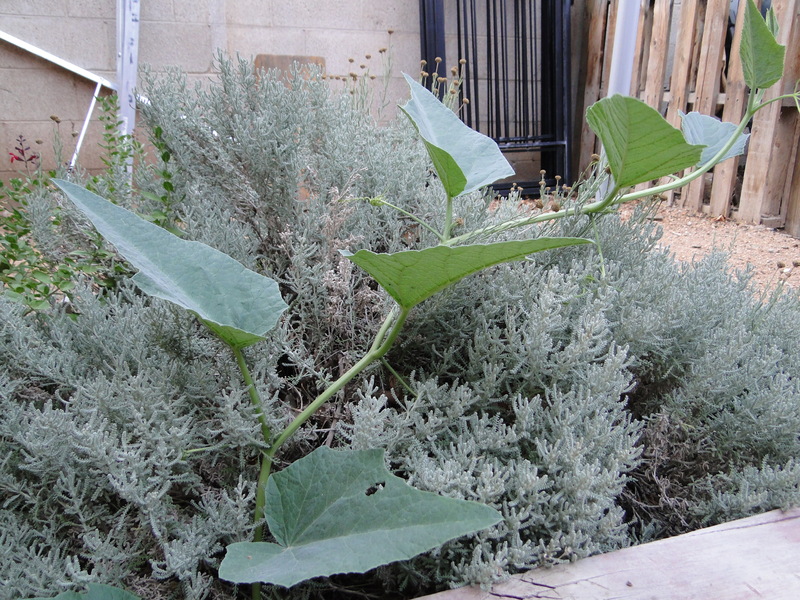 As this is a native gourd, I’m assuming it and the squash beetles evolved together, and so the gourd has long since learned to deal with them. One year I cut it and threw it in the garbage can. In two days it smelled like I’d stashed a body in there. It was repulsive. I’ll never do that again. I looked it up on Wikipedia and it sounds like I don’t stand a chance. Apparently the taproot on these dudes can grow up to 72 kilograms and 2.5 meters long. That’s 158 pounds and 8.2 feet for the metrically challenged. Gad. Imagine if these things ever bred with zucchini. Zucchini is hard enough to stop. 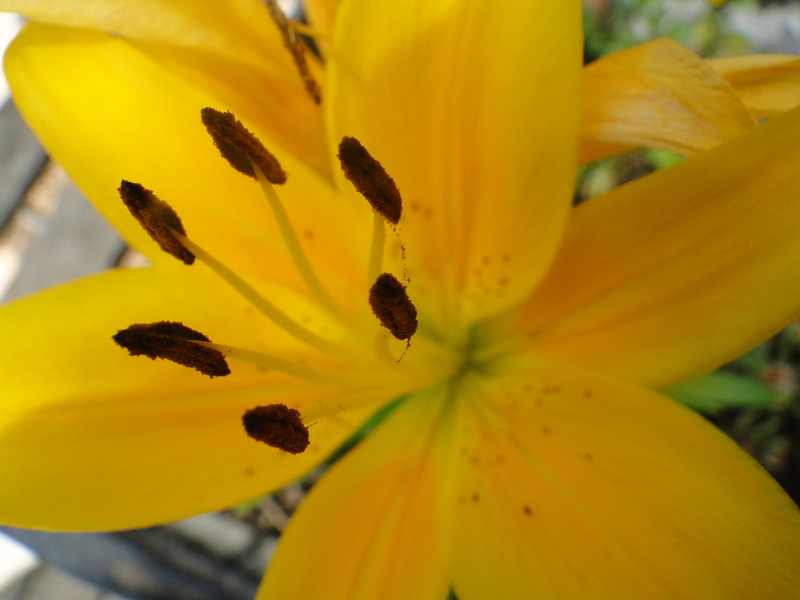 If it was perennial and had a taproot, the world would be overrun. We’d be trying to fuel vehicles on zucchini. A yes. The orange blush. The hefty girth. This, gentle reader, is the first peach of the season, about to be sliced and added to a bowl of Dreyer’s Vanilla Bean ice cream, accompanied by a chilled bottle of root beer. Life is good. 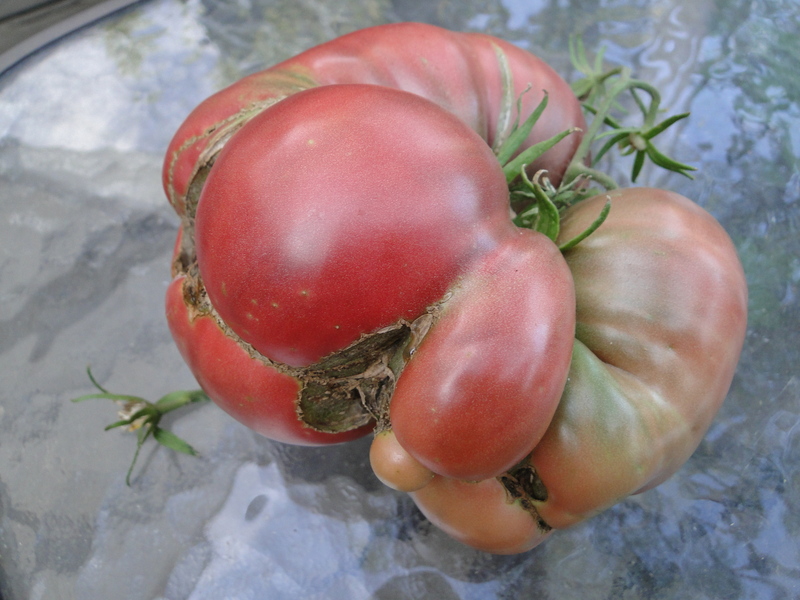 Last year the folks at Soulsby Farm sponsored an ugly tomato contest, and I deeply regret that this dude was not here to enter. It’s a Brandywine, which taste like heaven, and don’t think for a second it is so groovy looking we didn’t slice it up and eat it along with some fresh basil and mozzarella cheese. 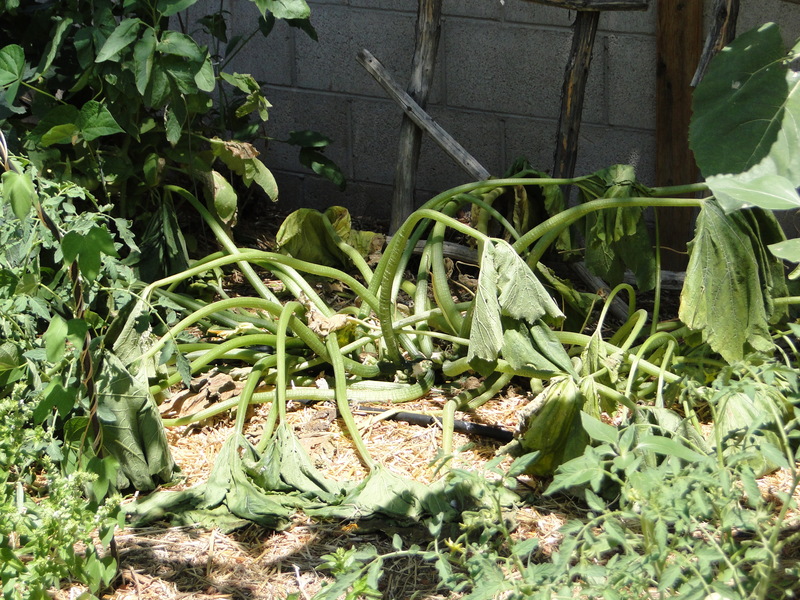 This is what happens- the zucchini hums along and then dies. 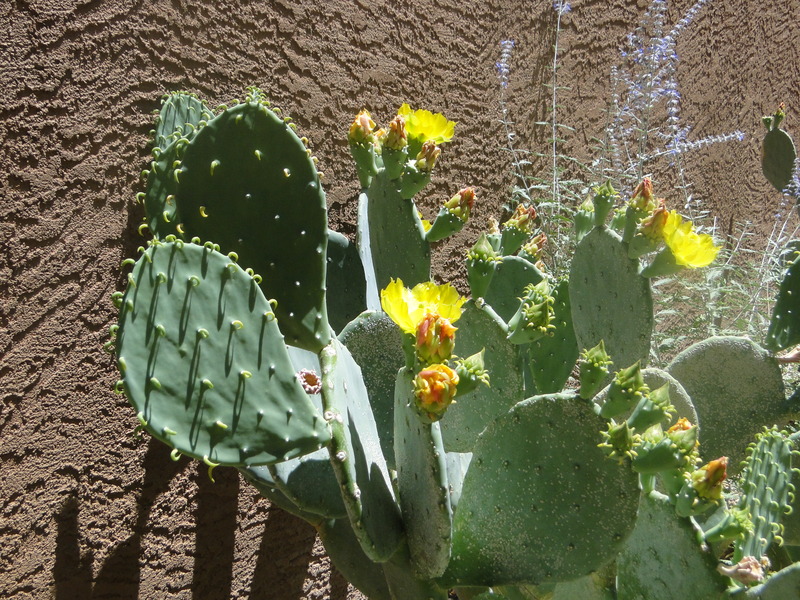 I have fought these dudes for years to no avail (avoiding the really toxic stuff); this year I decided to just let them be. The plants seem to be dying at about the same time, maybe slightly more unexpectedly but no less permanently- dead being dead and all. 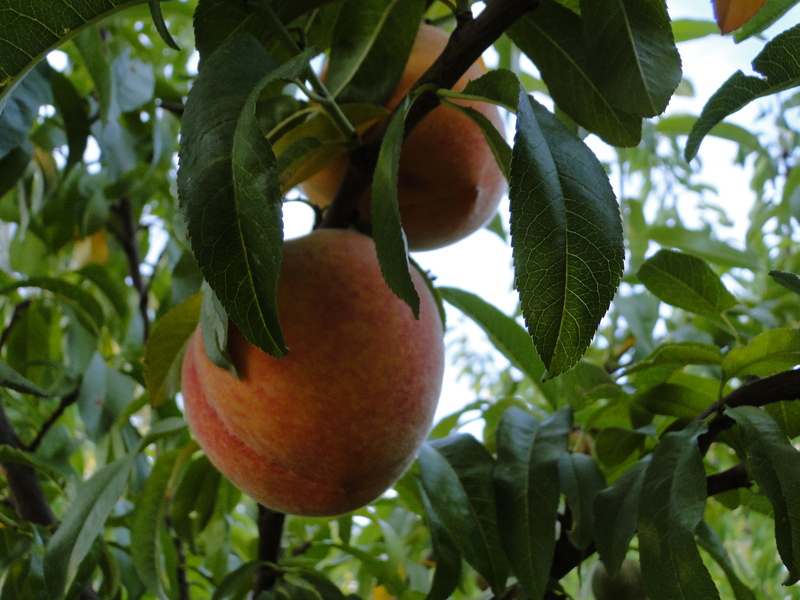 The above is a peach, almost ready to go. 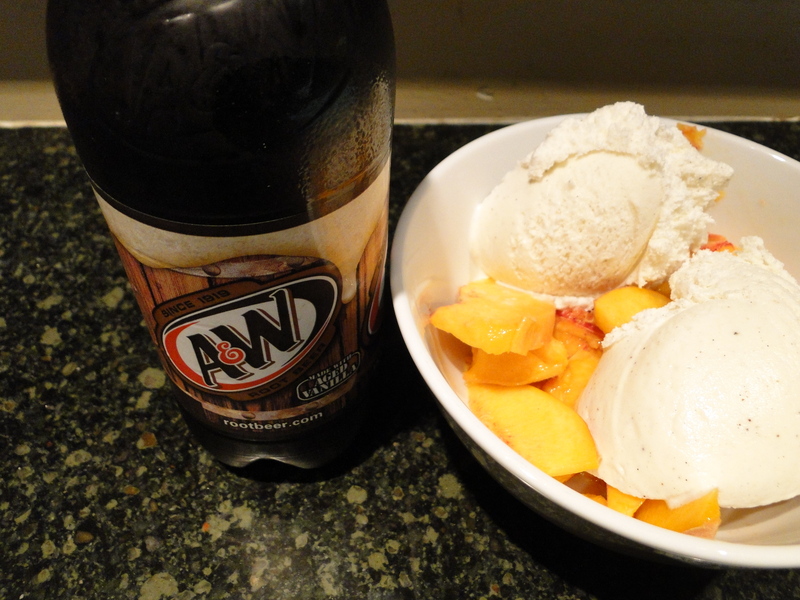 Then it is bowl-of-vanilla-ice-cream-with-peaches-and-a-side-of-root-beer-in-a-chilled-bottle-season. One of my favorites, right up there with autumn. Whoa! It’s been a while since my last post. 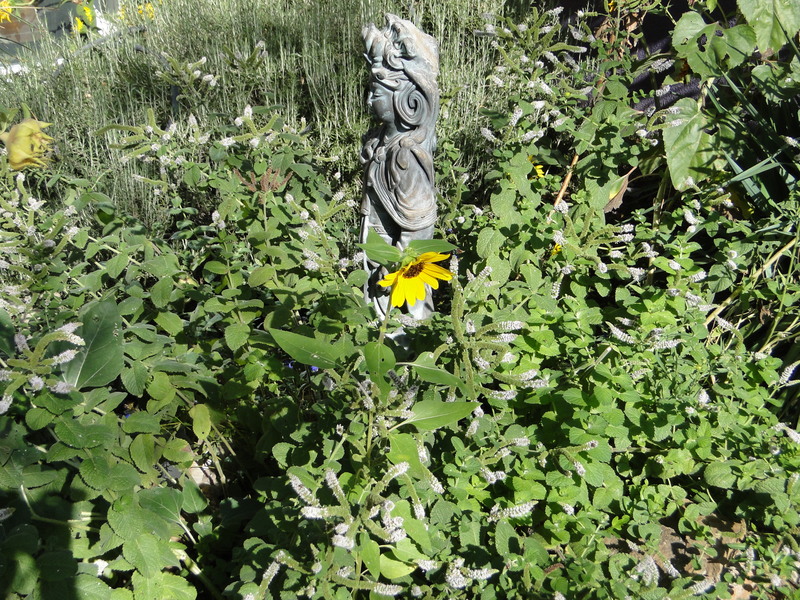 I’ve been so busy in the garden I haven’t had time to write about it. But lots of things are happening. And my big experiment continues: Apple Condoms! Ok, condom is not the best analogy, as the goal is not to prevent conception. 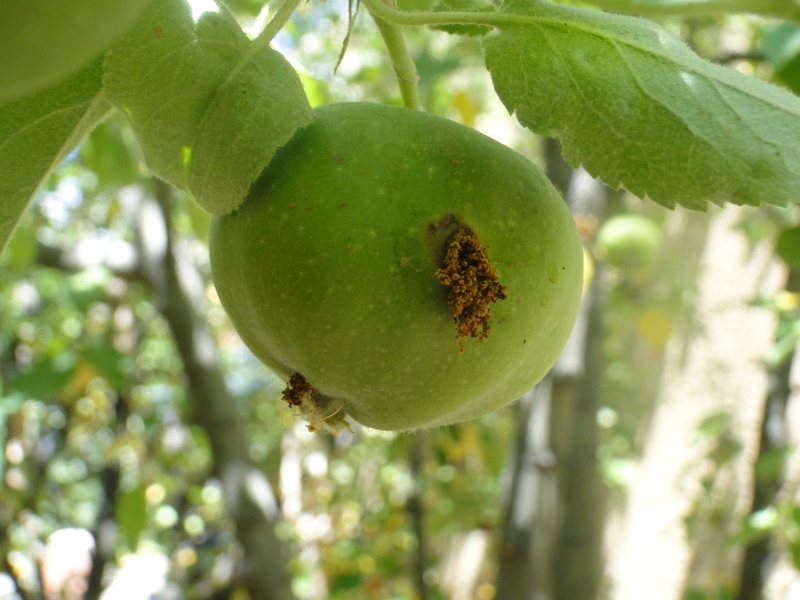 Instead I am trying to do something about the notorious apple codling moth. These little dudes lay their eggs hereabouts, and their larvae burrow into the apples where they eat the innards and deposit blobs of frass. Frass would make a swell cuss word, by the way. 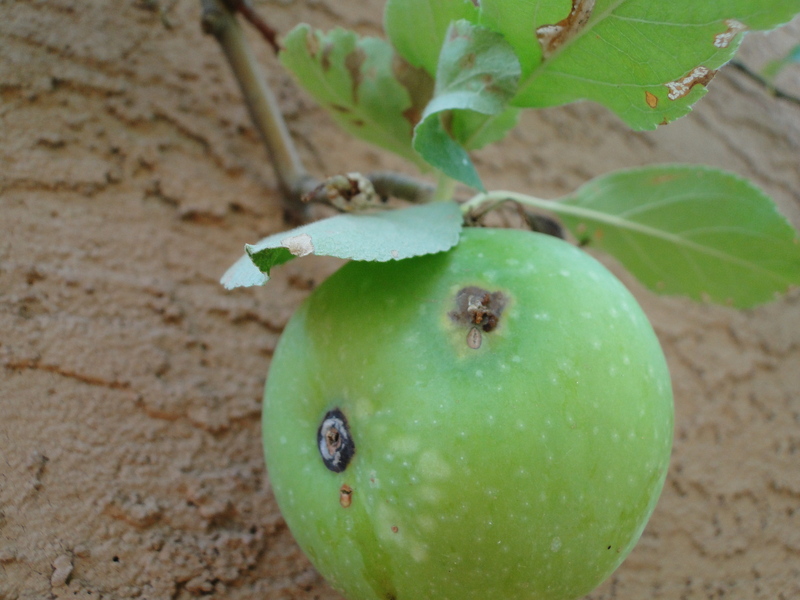 Codling moths are not easy to get rid of, even if one is willing to go the poison route, as they hide in the apples where poison cannot find them. You have to have good timing to get them. But now we have this recent innovation, the apple…sleeve? Hose? 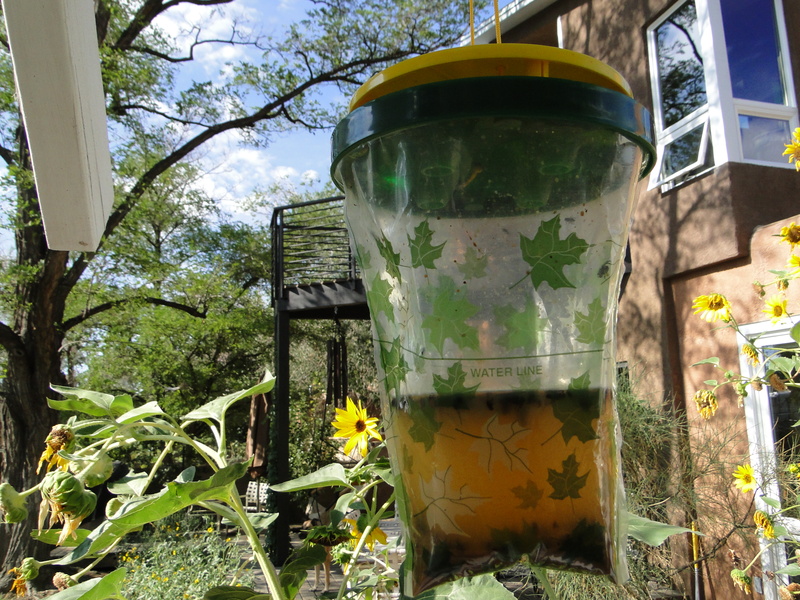 You apply them after spring fruit drop and hopefully they keep the moths away. I have my doubts. It seems the larva could just crawl into the neck of condom/sleeve/wrapper/hose/thingy. In fact, after spending 30 minutes putting on the first three of them, and having one fall off, I was sure they wouldn’t work, and went back to the web to prove it to myself, but unfortunately everybody using them said they were wonderful. So I went back out and put the rest of them on- 144 of them. Nice to see something that still comes in a gross. It got easier. So, how about that picture above? Could be a sign of failure. 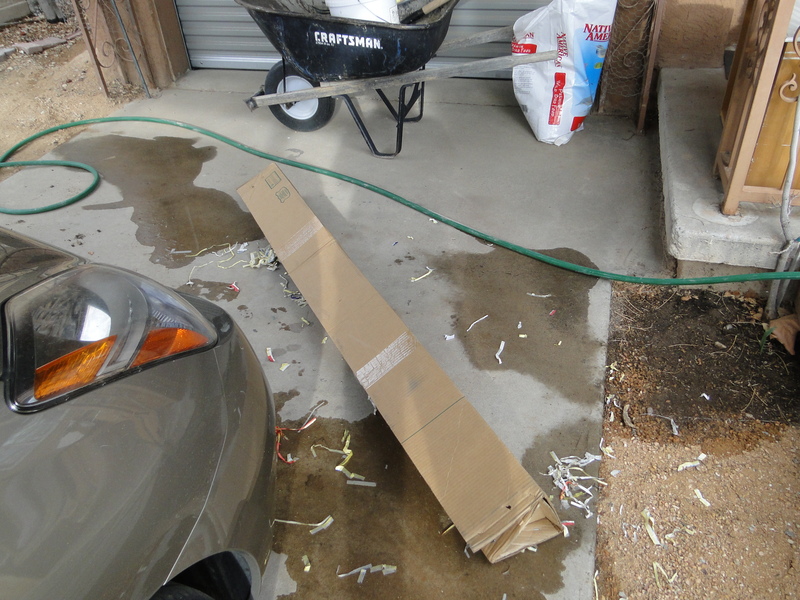 It also could be a sign that a worm got in before the thingy was on there. We’ll see what happens with the rest of them. There are still hundreds of apples on the trees without the thingies, and I’m happy to share. I can use the ones with a worm or two as cider apples, and I’d like the larva to leave the 144 to me for eating. It’s simple, really. Just sharing. 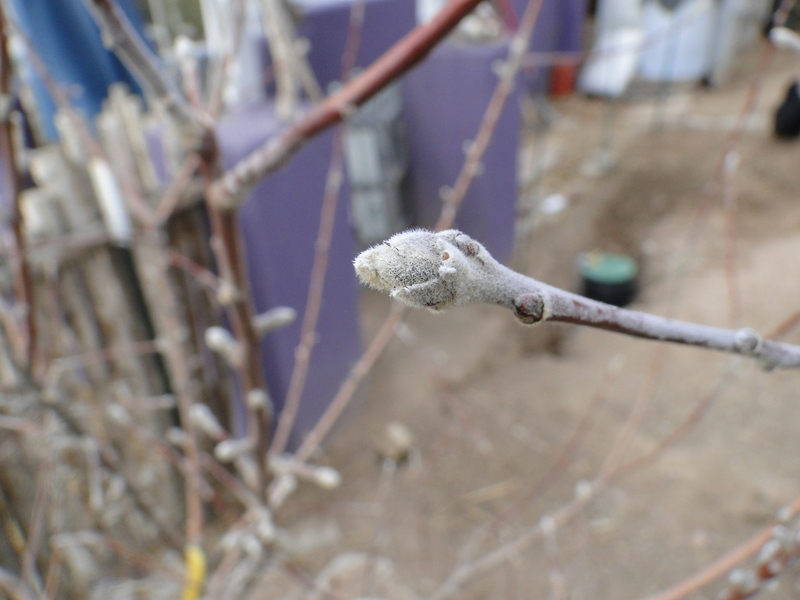 Hear that, oh codling moth? 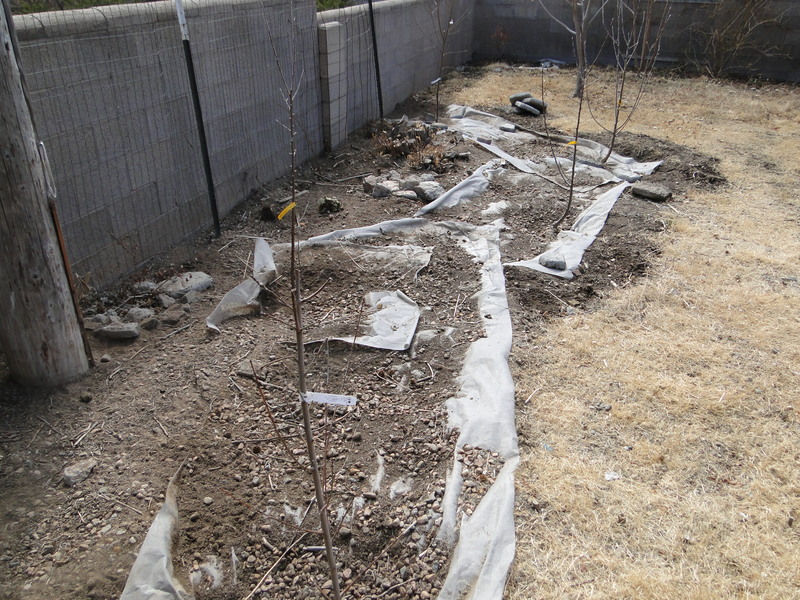 Peach trees; last night we had a spring freeze, and my little peach trees had (of course) blossomed for the occasion, so I’d gone out and covered them with sheets. 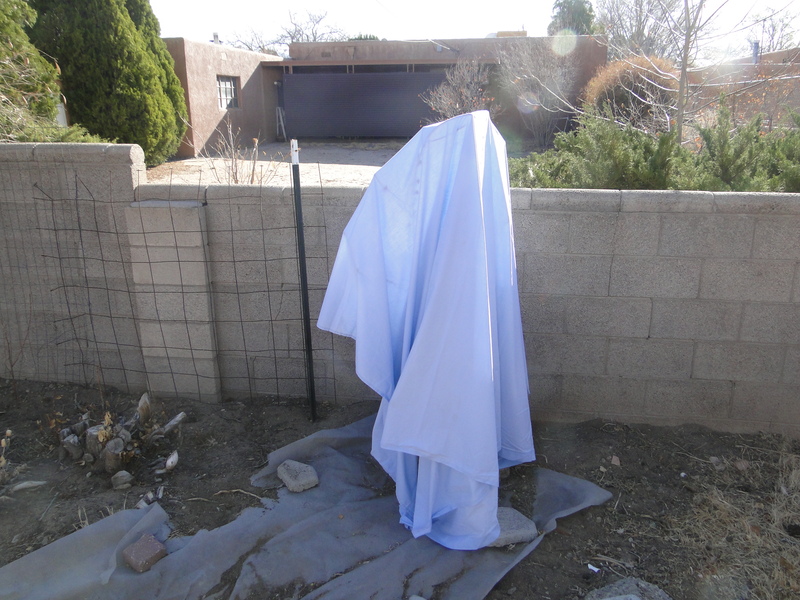 And you thought just wearing a sheet didn’t make you scary. I think she was proffering a kind of ‘test bark’, thinking, “Hmmm, that looks weird, and maybe inanimate, but I’ll bark and see if it moves. If it moves, I’m outta here.” I kind of wish it had been windy, just to see what she would have done if it had moved. 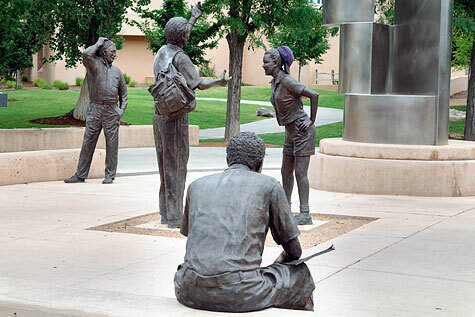 She had a very difficult time once years ago when I took her for a walk on the UNM campus and we passed by some full-size life-like bronze statues. 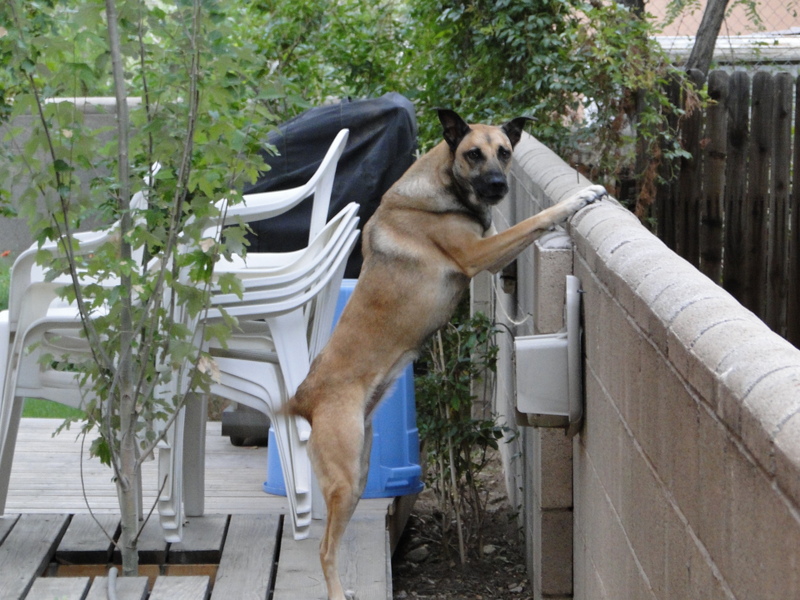 She barked and barked, wondering just what was up with those odd, immobile people. Such a good dog. 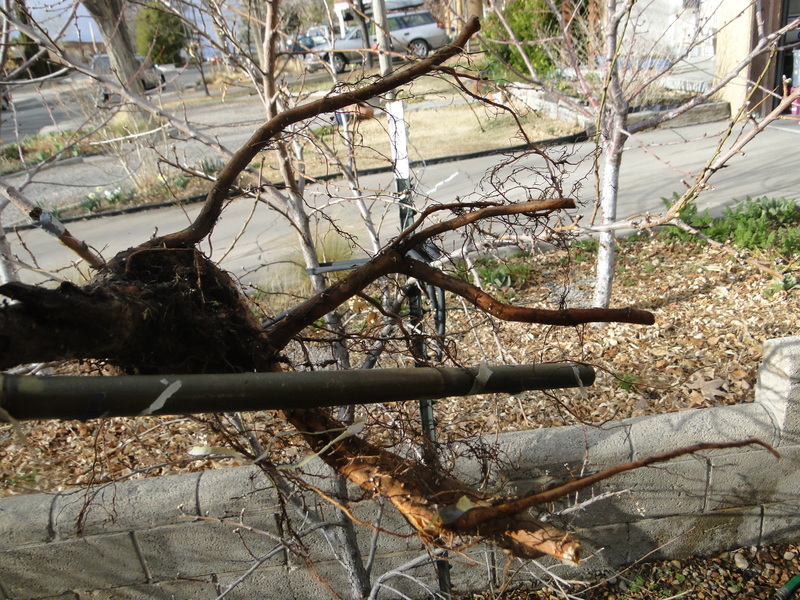 Maybe it was her ‘freeze bark’, alerting me that the trees needed help. Now it is in the forties and the trees look a bit touched. Tonight is forecast to be just as cold (around 28) and tomorrow 32. So, more sheets, and I’ll just have to hope. The trees are lucky they are still small enough to get covered at all. 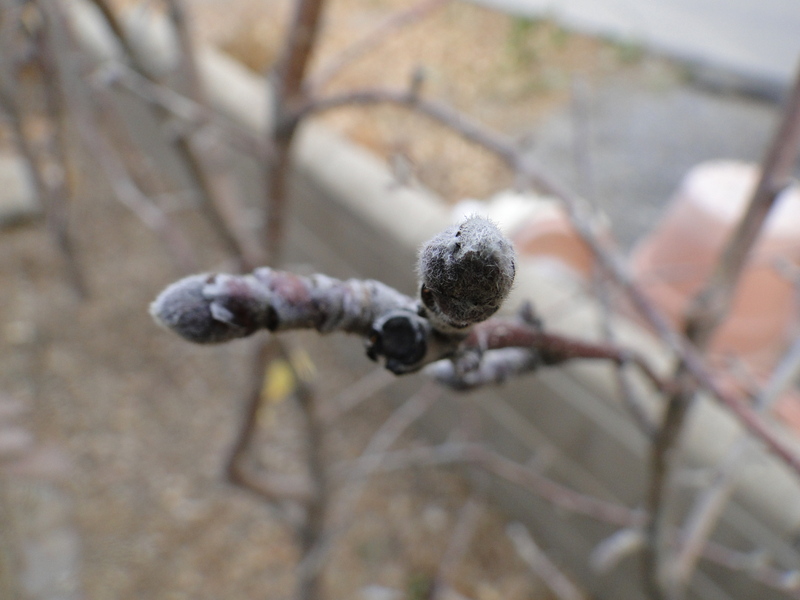 Fortunately the other peach (the big one) has not yet bloomed, nor have any of the apples. 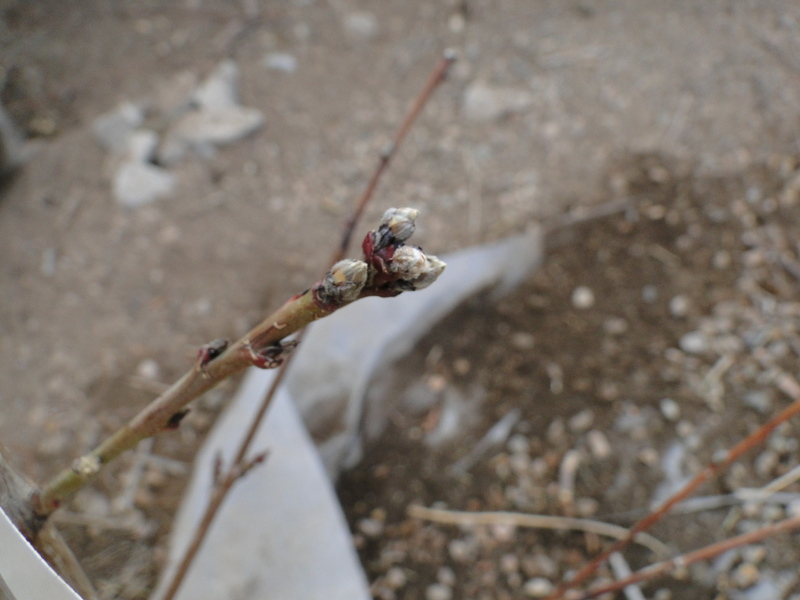 But there are other signs of spring: the poplar buds are almost opening, the forsythia are in full bloom, and even the poor, beaten-down Sand Cherry is starting to bud. …that was, as I said, years ago. 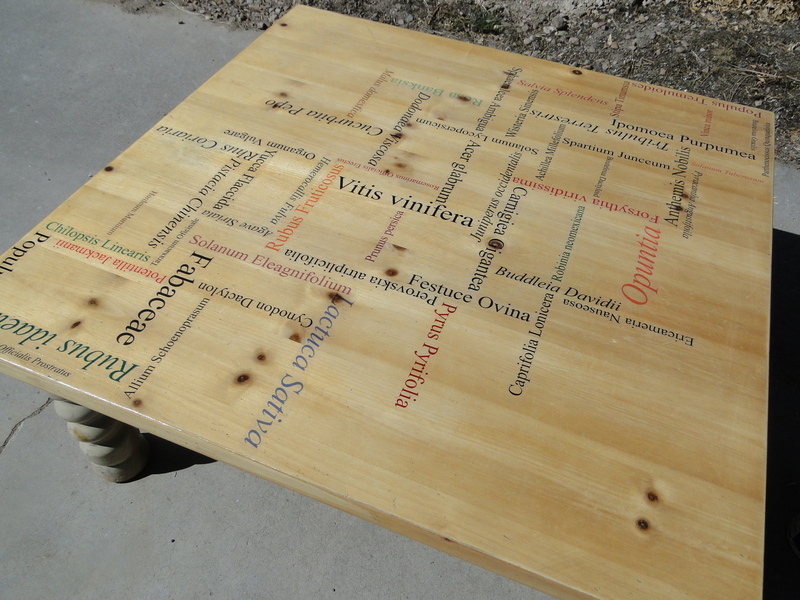 But we finally did it; instead of painting it, we sanded it back to new wood and decorated it with the scientific names of all the plants in our yard, plus a few extra beloved species, like Aspen and Saguaro Cactus. Whoa- leave town for a week and Spring sneaks in and gets all kinds of stuff going! 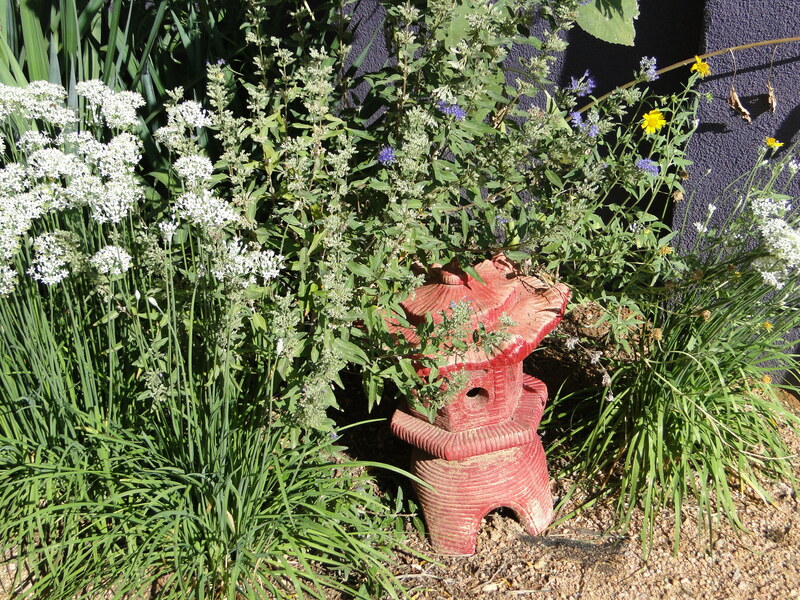 We just returned from a week of cavorting on the Colorado Plateau, and spent Saturday trying to catch up in the yard and garden. 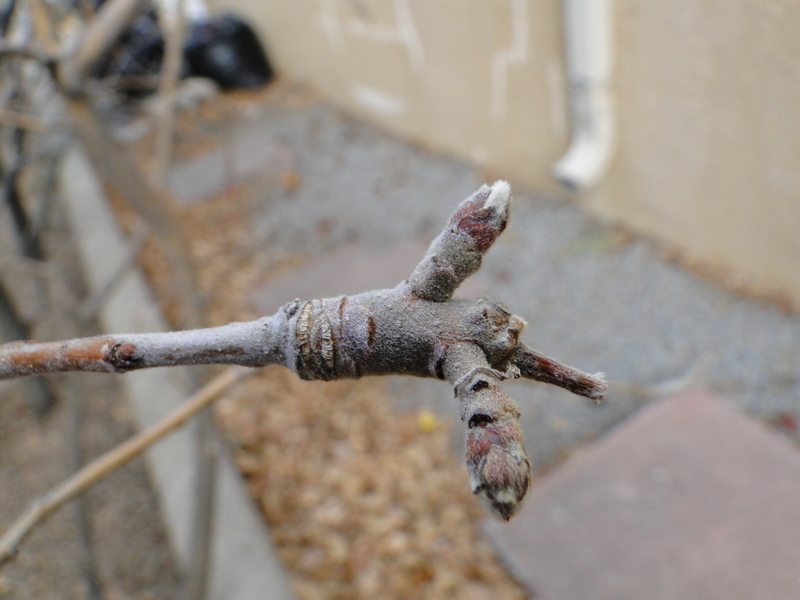 While we were gone my package from the Tree Fairy came…or rather, from Raintree Nursery: a new Plum Tree. It came Monday; I talked to my daughter (who stayed home) Thursday and she mentioned that I had a package and she’d brought it inside. Yikes! I told her to put it back outside in the shade. I didn’t want the tree trying to wake up and grow in our nice warm house. Unfortunately, it was pretty nice and warm outside, too. I opened it up and it looked dormant enough, and well packed too. 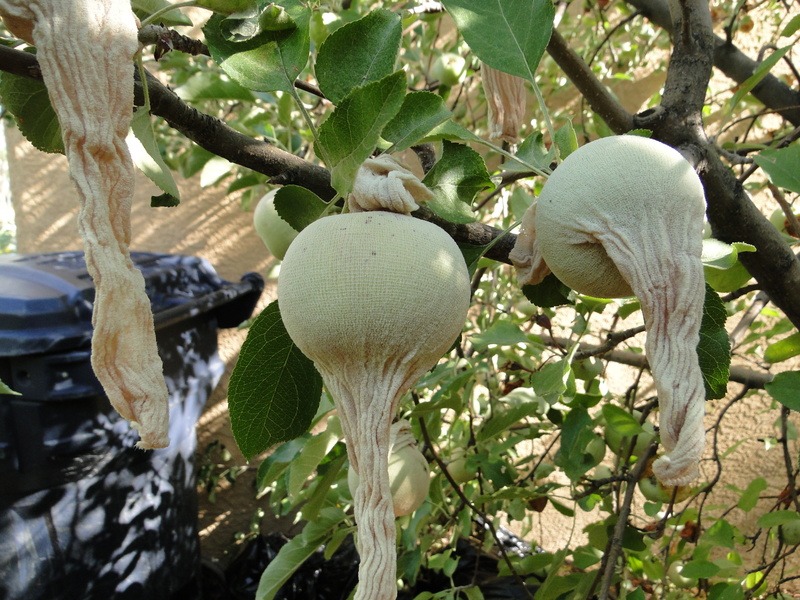 In the past I’ve bought trees exclusively from Trees of Antiquity (13 trees so far), but I went with Raintree this time because they carried these hopefully awesome little apple socks that you can put on your fruit to keep the codling moths away. 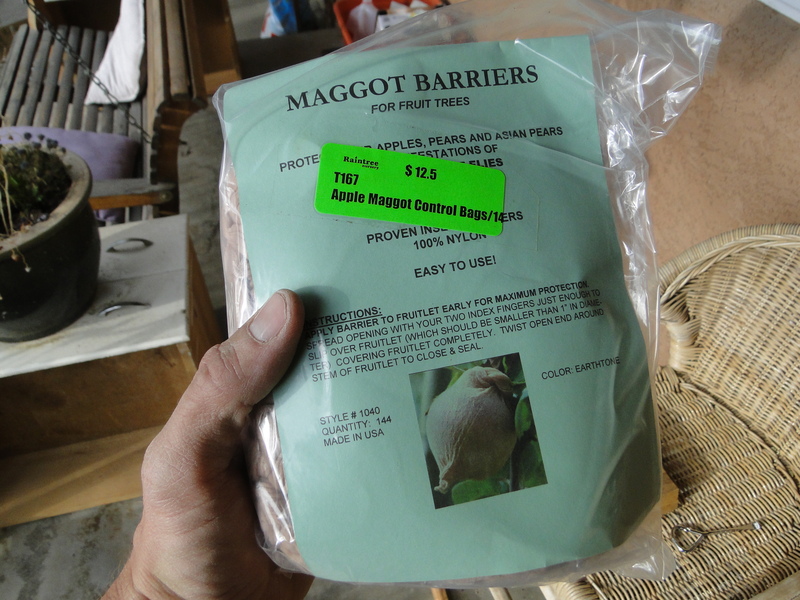 The package says ‘maggot barriers’, which is a different creature from the codling moth, but I’m hoping that they will work. 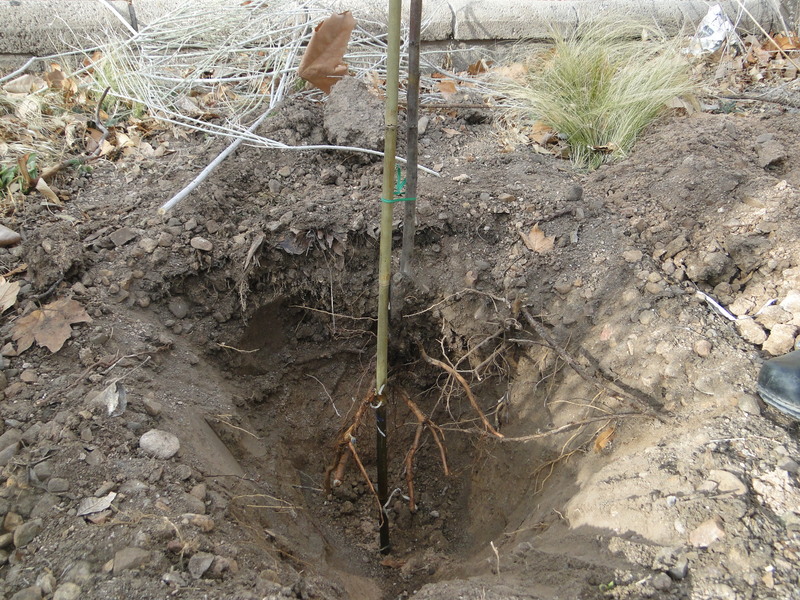 Now you dig a nice big hole, mix the existing soil with an equal measure of potting soil, compost, or similar (the idea being to help the tree, but not so much it is unwilling to spread its roots into the local soil), and place the tree in the hole such that the graft will end up above the soil level. 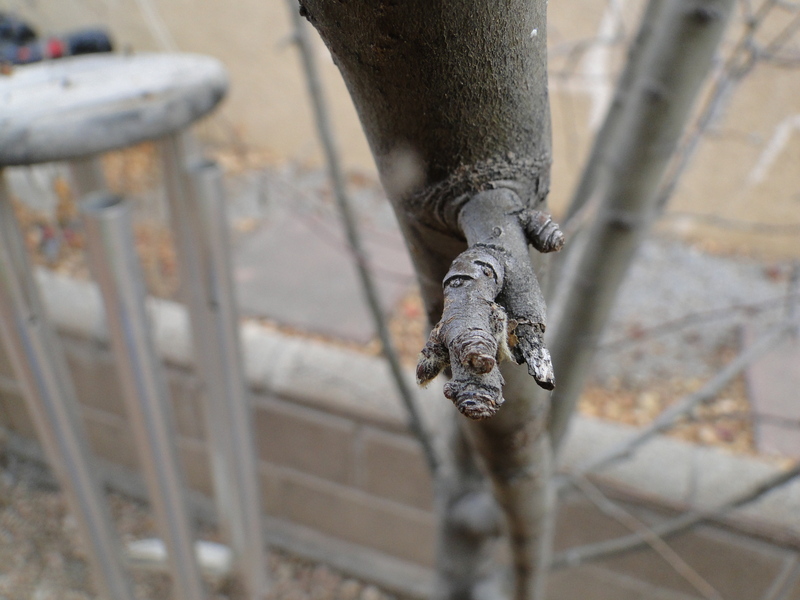 This tree (and all my others) are ‘semi-dwarf’ trees, meaning the regular tree has been grafted on to a root stock that will keep it from growing to full height. 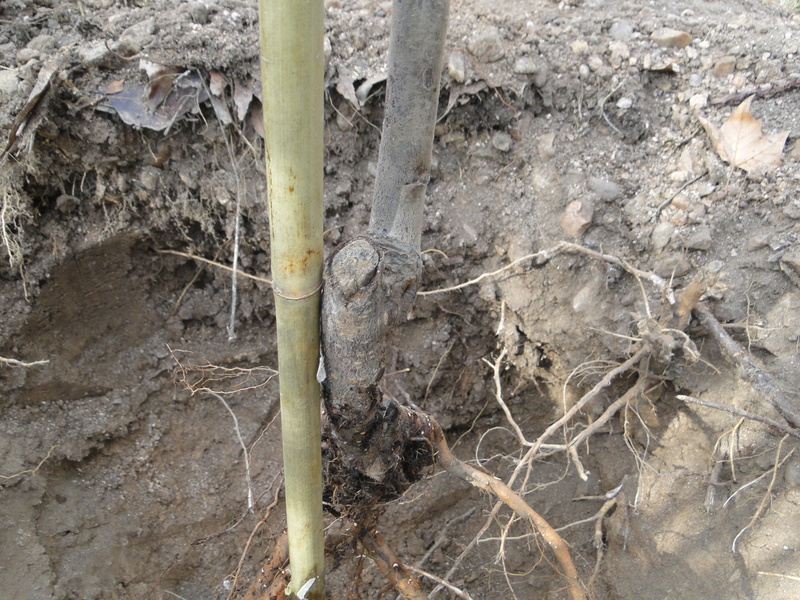 If you plant the graft below the soil line, the actual tree stock may take root and produce a full size tree. This was also seed starting day. 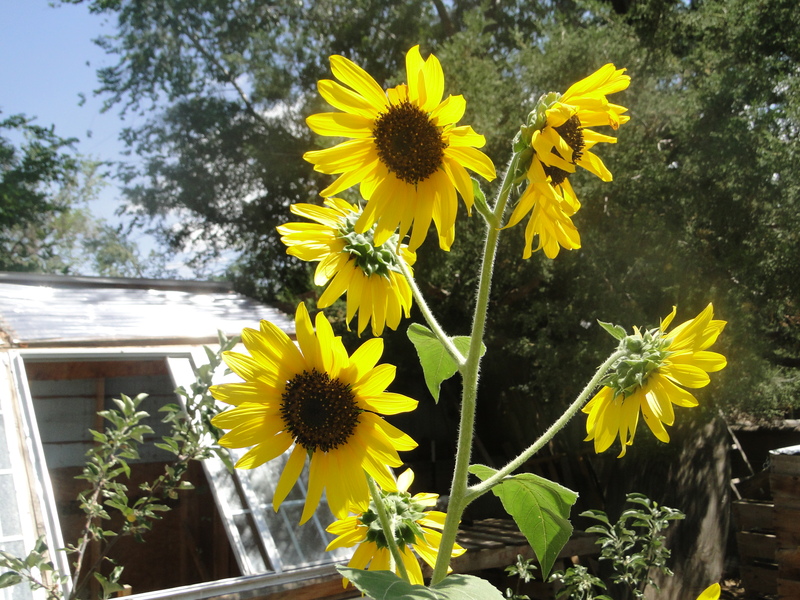 We might have one or two more freezes (our last freeze the previous spring was May 1st), so I start the seeds in cups and move them into the garden at the beginning of May. 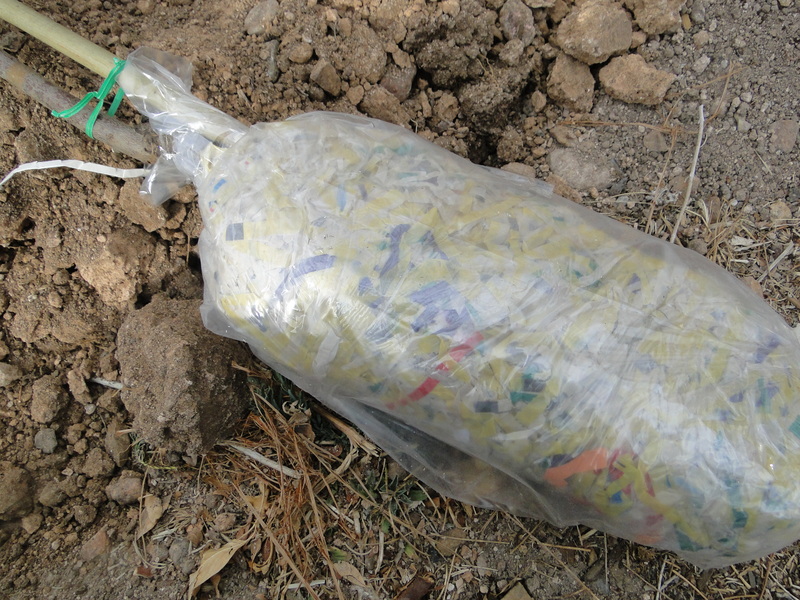 The materials, ready to go. 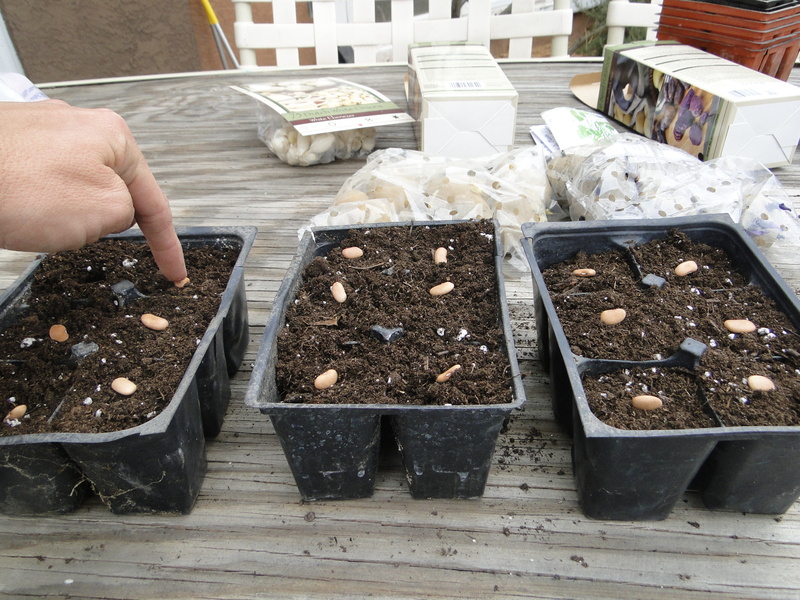 Bean seeds, about to get the finger. Plant one inch deep. Basil. 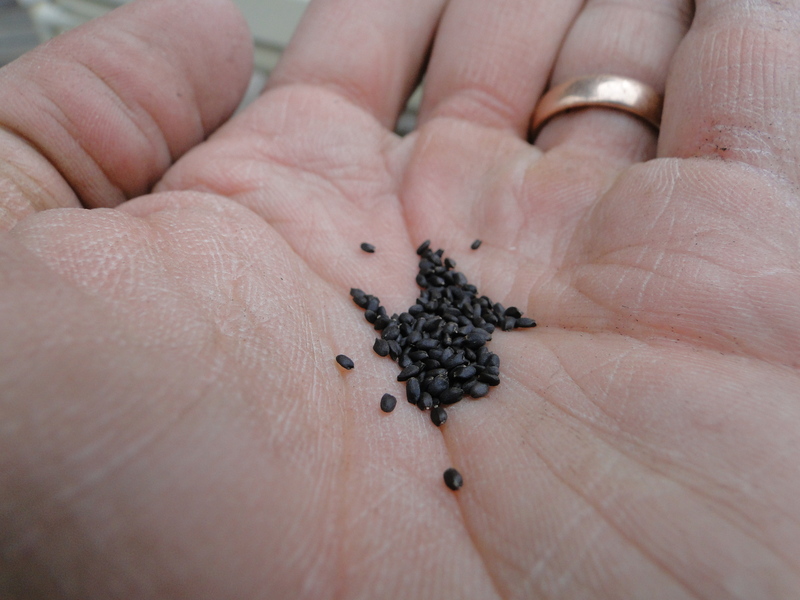 I scatter these and cover with a thin layer of additional soil. 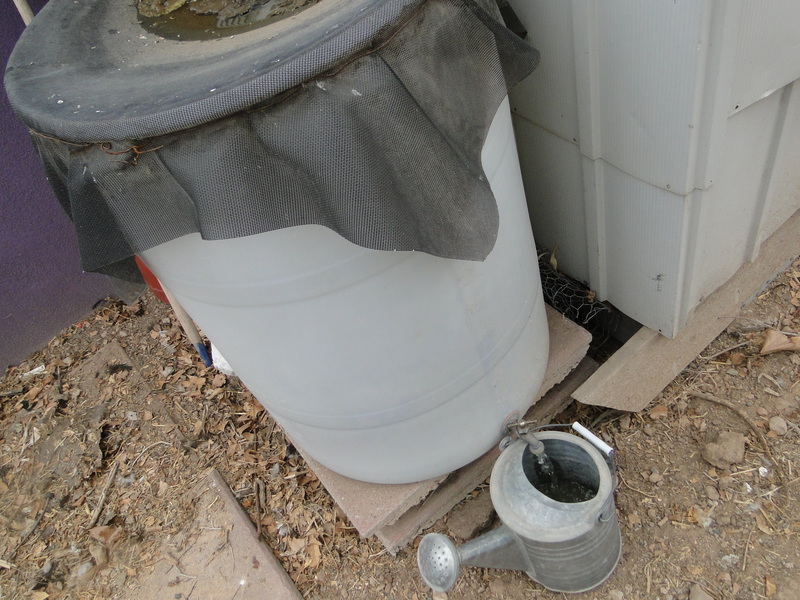 Getting water from the rain barrel, no longer frozen. 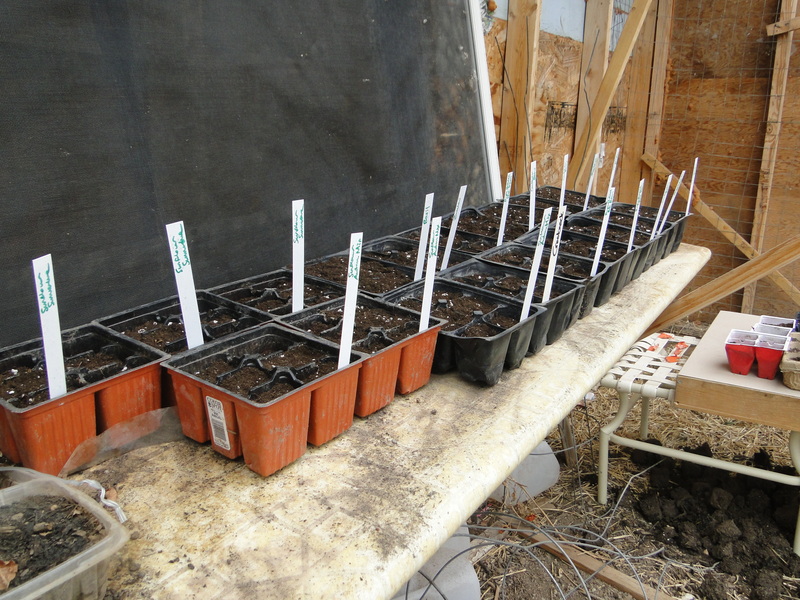 The seeds, watered and labeled, on their table in the greenhouse. 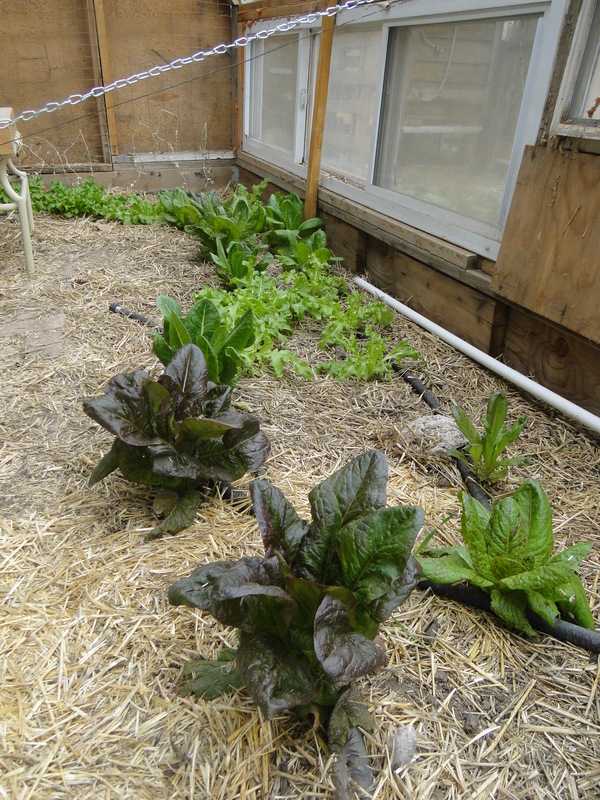 And the lettuce on the ground, looking good. 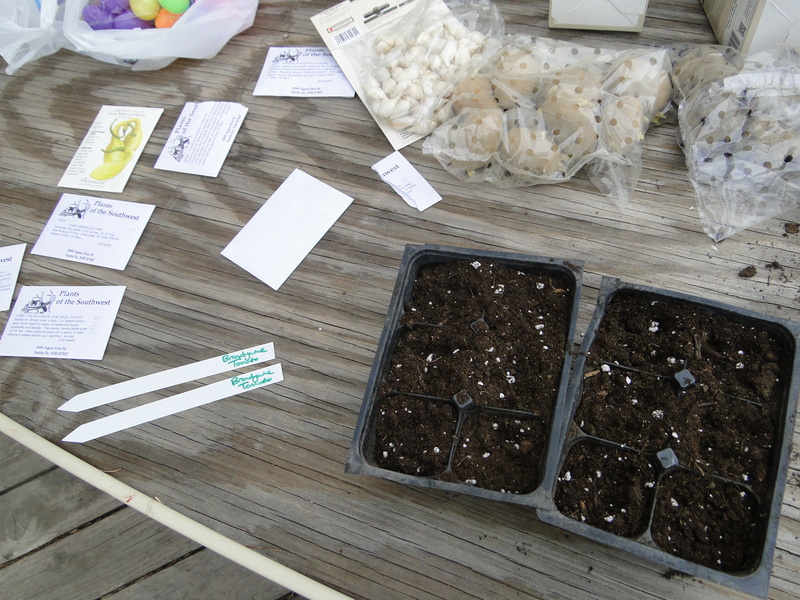 I also planted potatoes; they are already sprouting, so I will just have to watch the weather and be ready to cover things up if a freeze comes. Usually our spring freezes are just barely below freezing, no lower than 30 degrees, so covering works well. 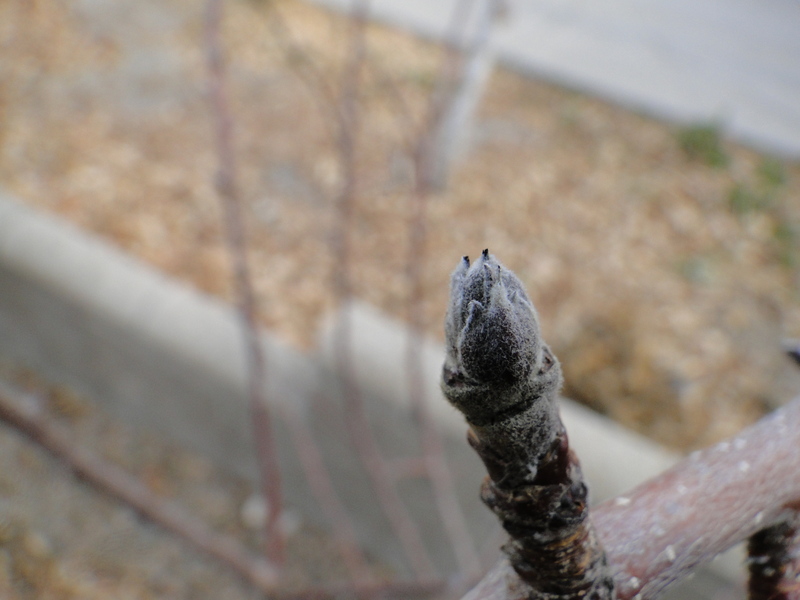 One of the pears about to bud; I wish the other one was about to bud, because they need each other for pollination. 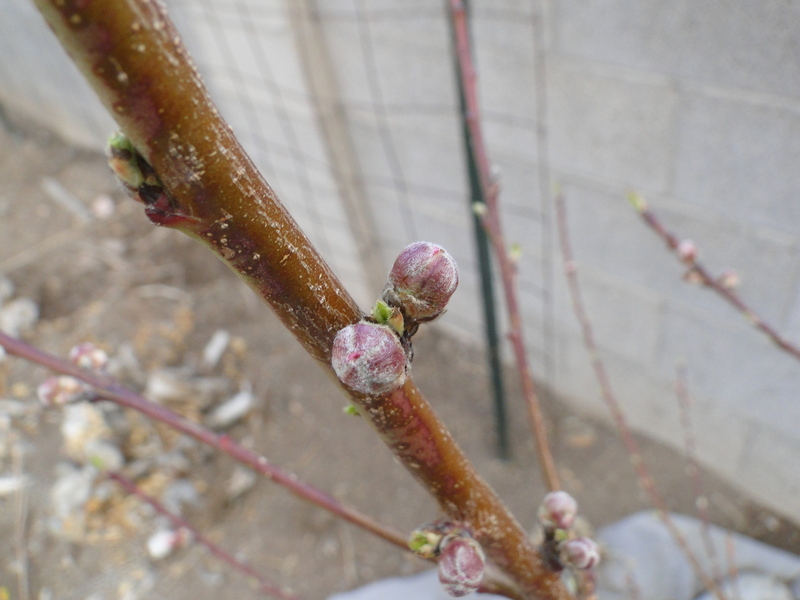 Peach buds swelling nicely. 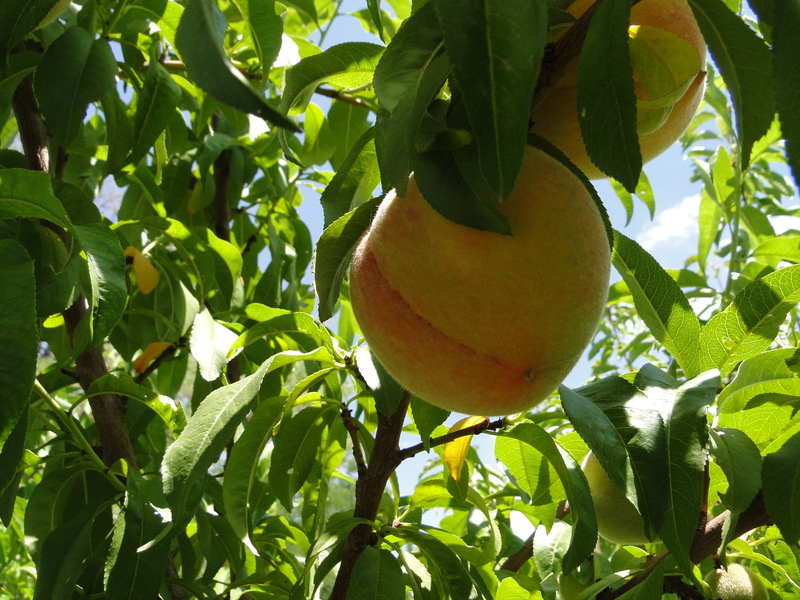 This is a Rio Oso peach, in a shadier spot than the two below. 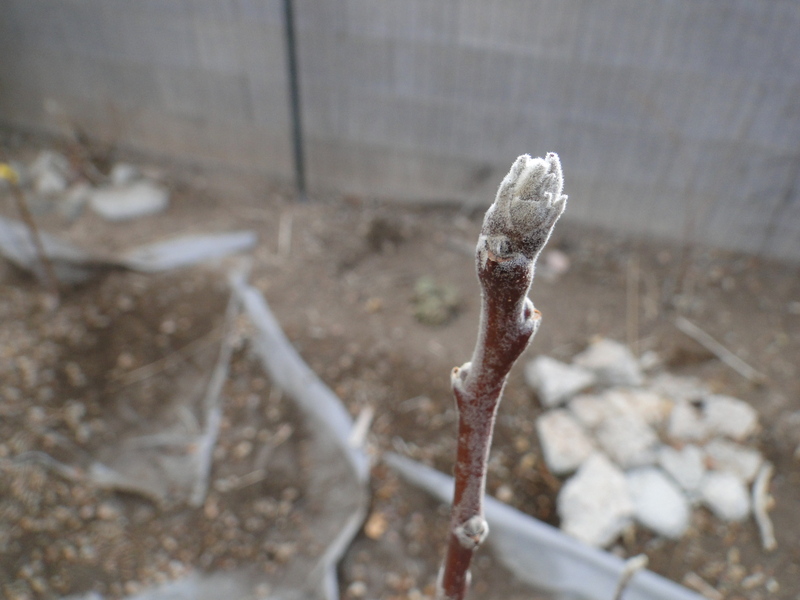 Cinnamon Spice apple about to open up. 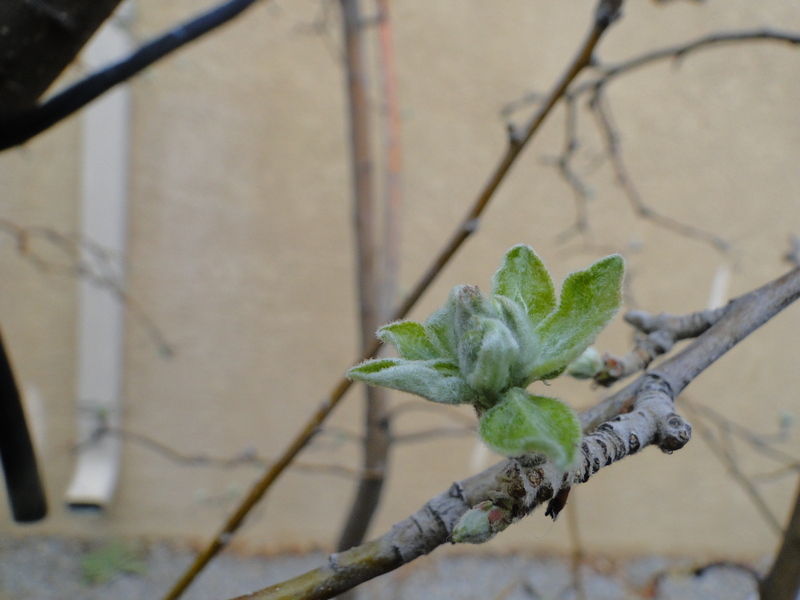 Granny Smith leafing out. Granny is always first, but only the leaves. 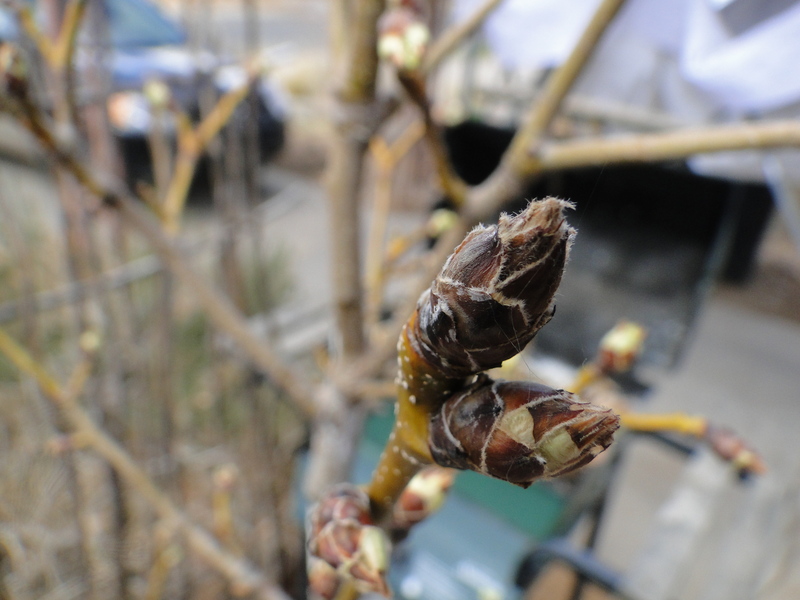 The blossoms come later. Belle of Georgia Peach. 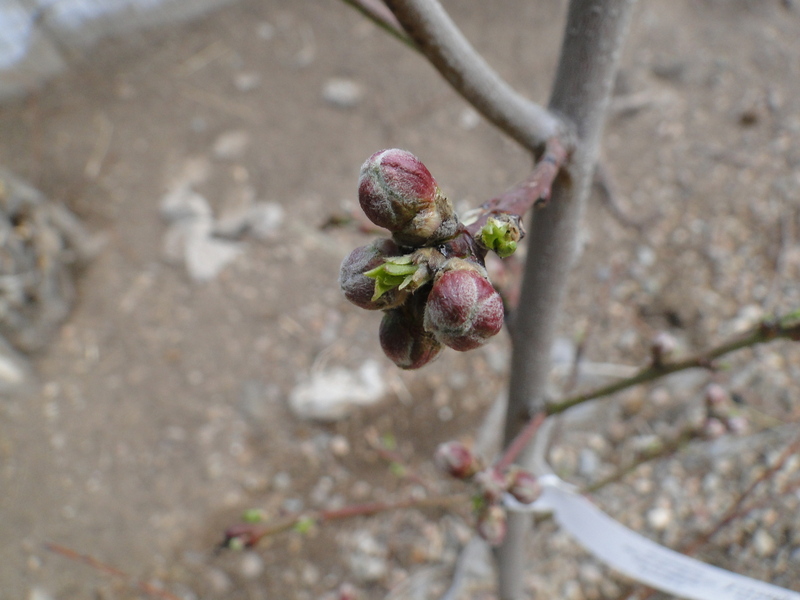 Leaves and blossoms emerging. 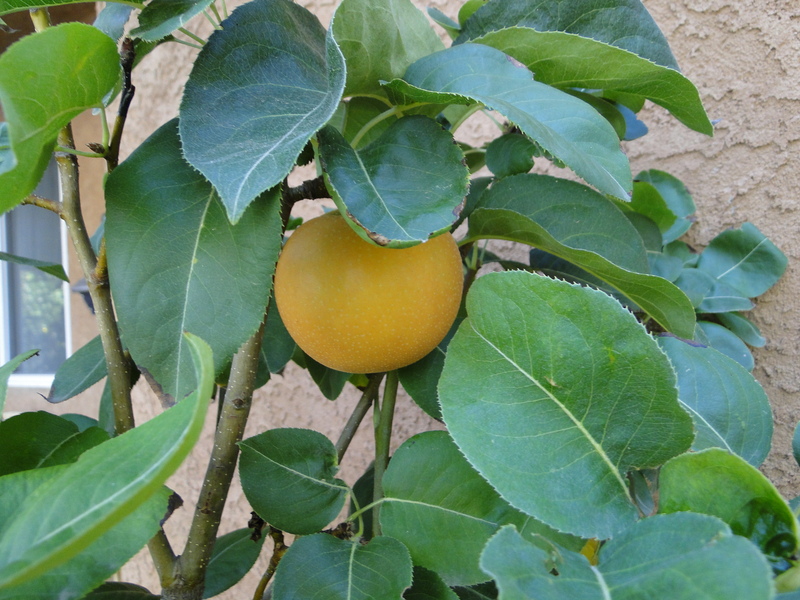 Dixon Peach. Leaves and blossoms too. 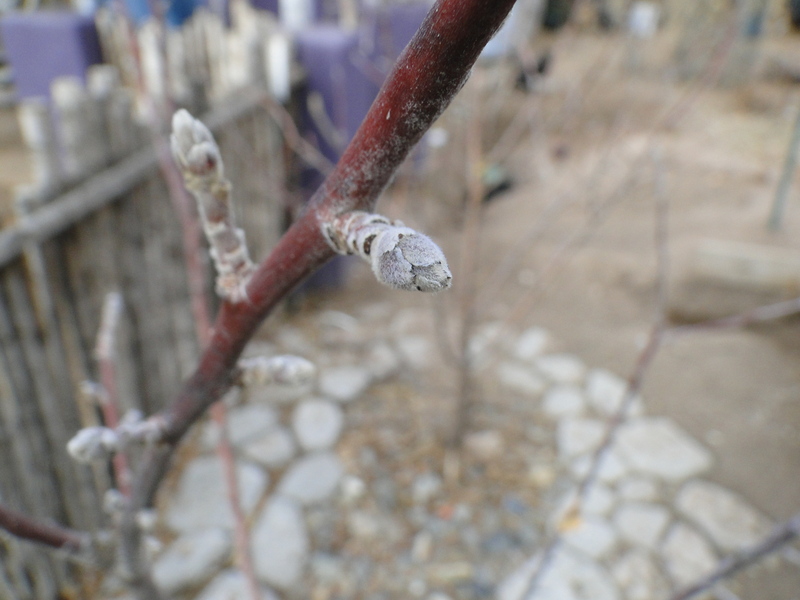 The apricot trees are already blooming, but I don’t have apricots. Tonight it will be about 37 or so; then it warms a little, dips into the high 30’s later this week. No problem. 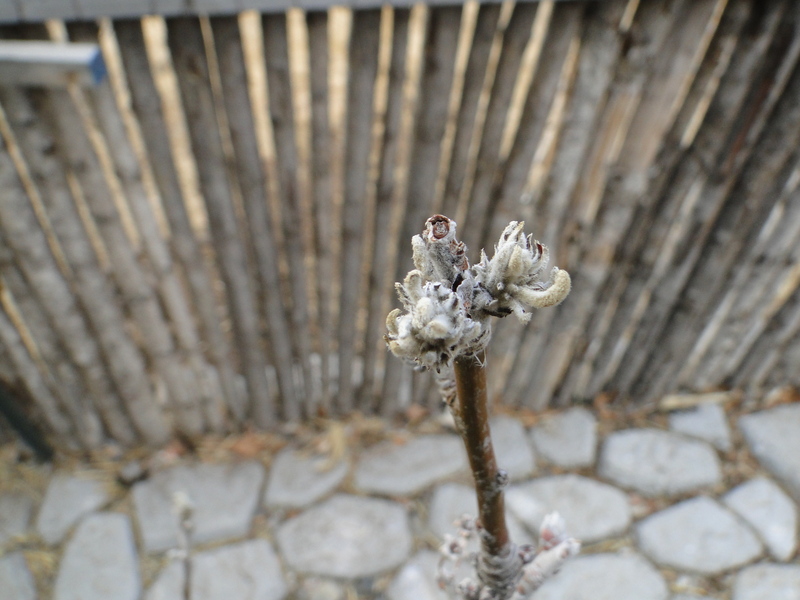 This is always the tricky time, wondering if some freeze will come along that wipes out all those precious, beautiful blossoms. 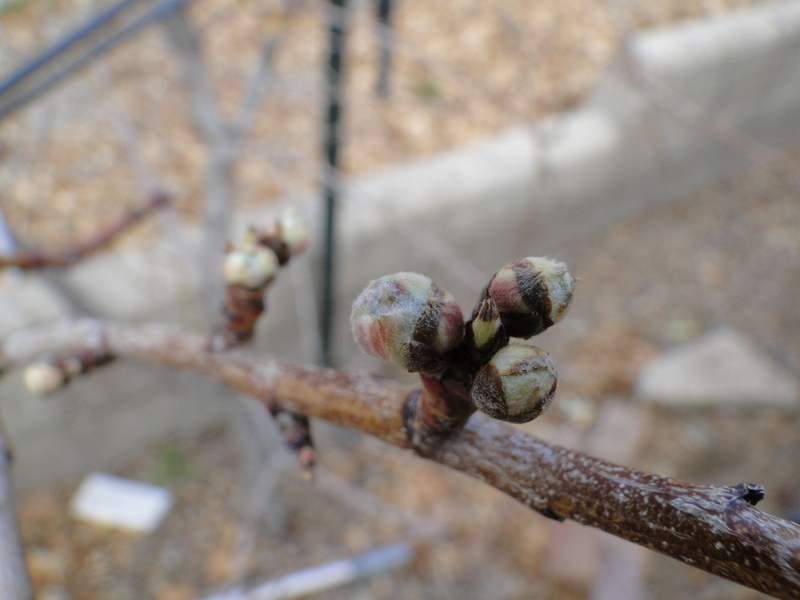 Last year the apricots, which usually commit suicide this time of year by blooming early, got all their blooming done before the final freeze, and we had a bumper crop. I still have jam from last year, and as I said, I don’t even grow apricots. If all goes well I am going to be hip deep in apples come fall, which is fine with me. Apple pie, apple cider, apple butter, and fresh eating until I can’t stand it anymore. Yum! Spring is not here. Not yet. 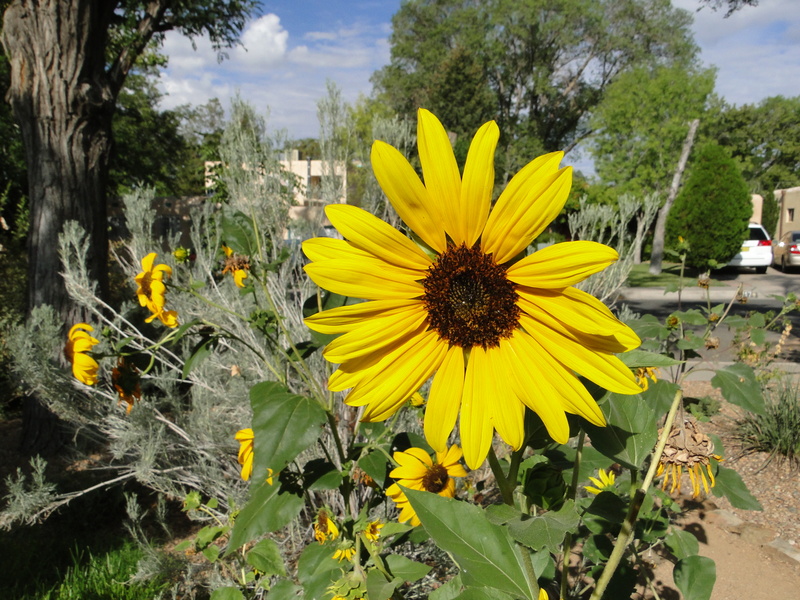 Here in Albuquerque one can expect a freeze as late as May 1st. 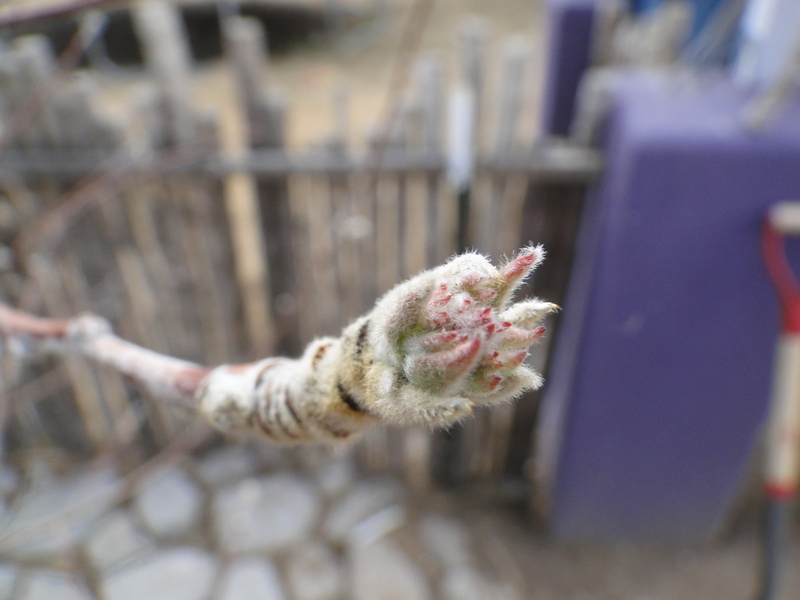 But there is a hint of spring in the air, and tasks to be done. 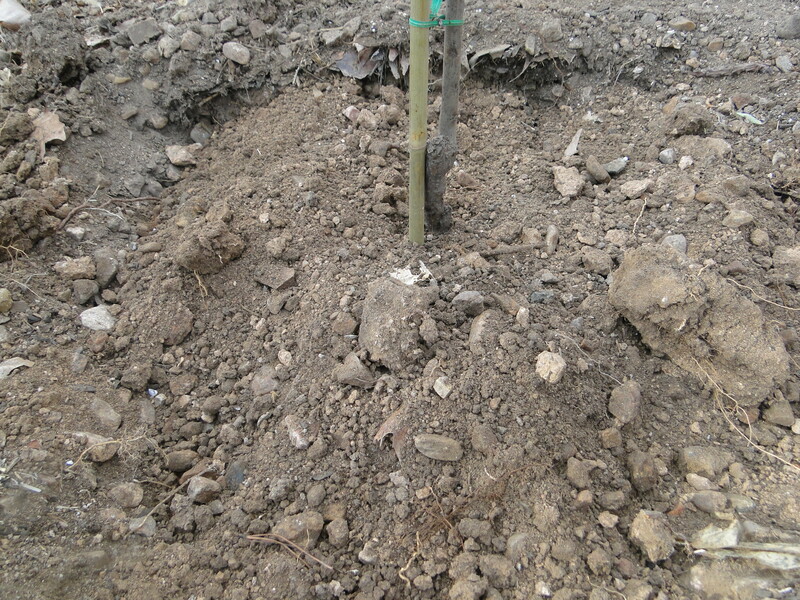 We accomplished one of the first this morning: redoing the rock mulch under the apple trees. 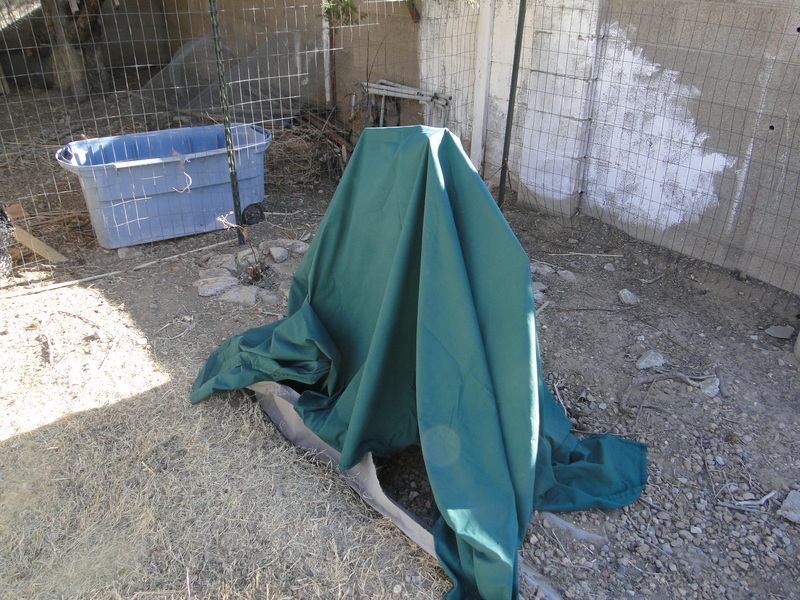 This particular group of trees is in with the chickens, so their basins are full of rocks to hold moisture and prevent the daily scratching of the chickens from leveling them out. 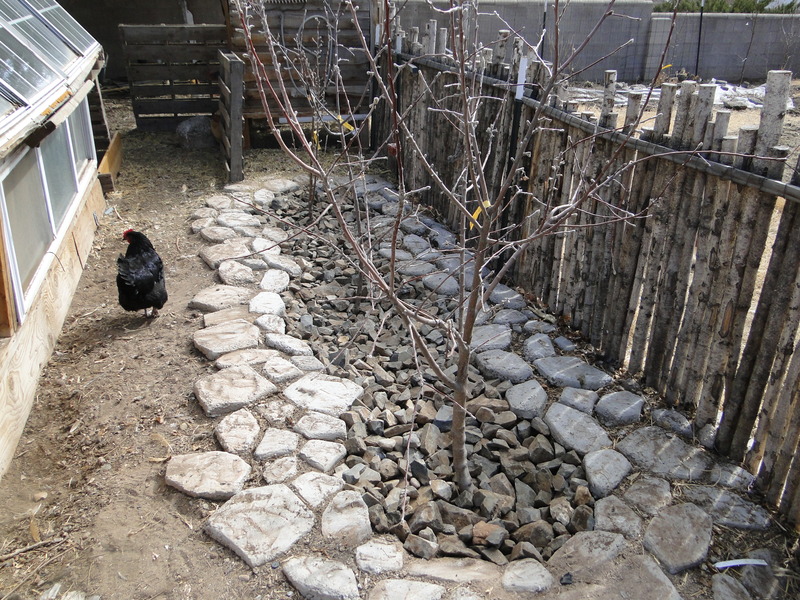 These rocks are large enough so the chickens can’t kick them out and scatter them across the yard. 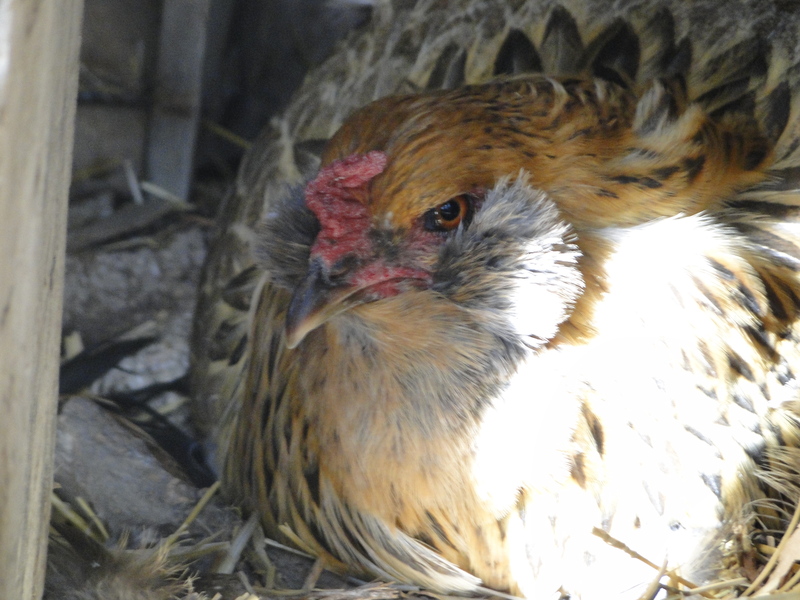 Nevertheless they get full of hay, chicken poop and dirt, so each spring we clean it all up. It’s the most Zen of tasks: first you take all the rocks out. Then you put them back in. Looks nice, yes? 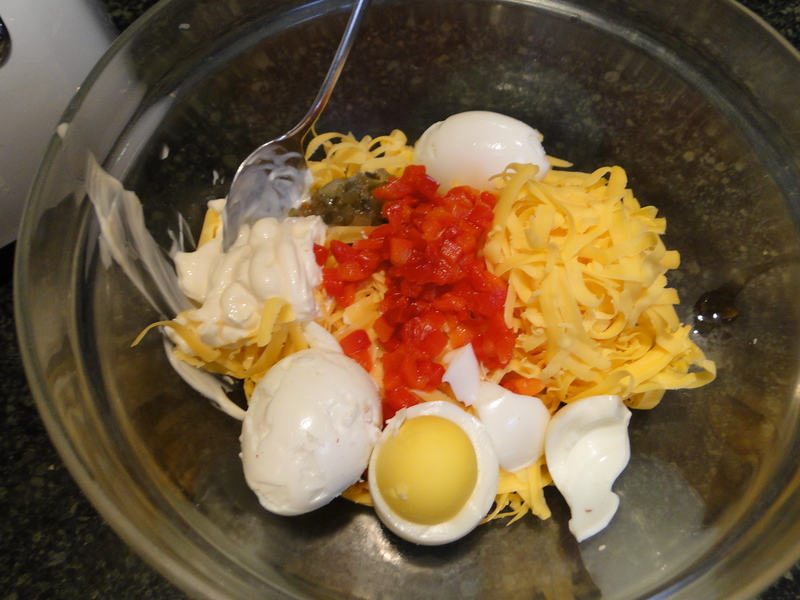 I forgot to take a ‘before’ picture, but rest assured that it was a mess. These apples here are about to get the treatment; tomorrow we go rock shopping. 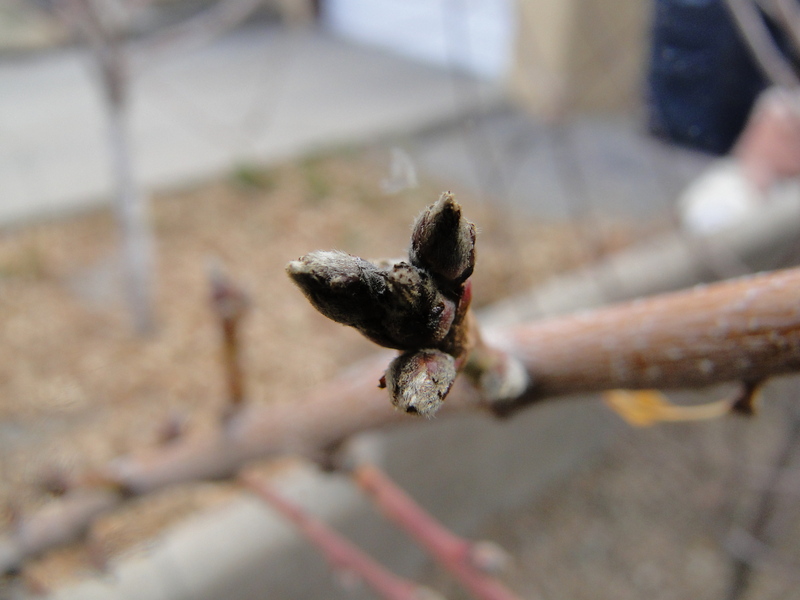 This time of year is when I start watching the fruit trees, hoping none of them get Ideas. 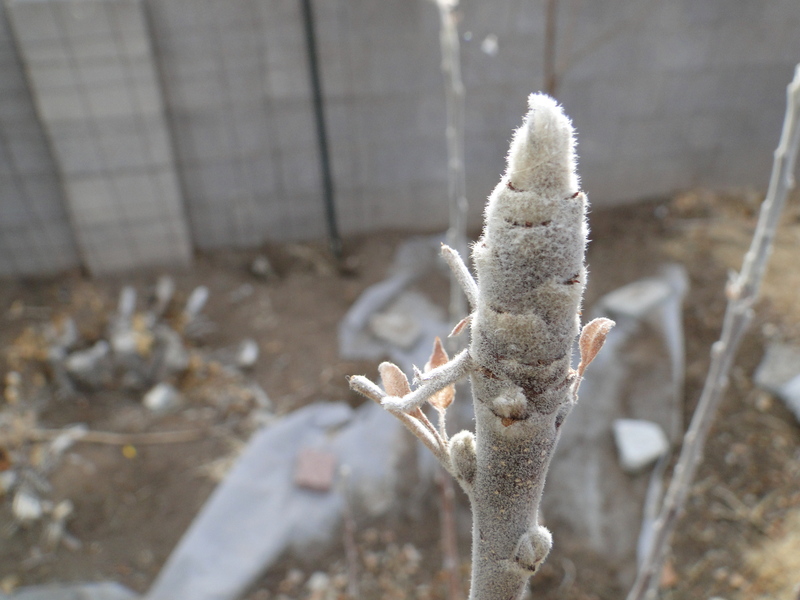 It’s not yet time to bloom, but we often have warm days with highs in the 60s or 70s this time of year, followed by a good hard freeze, so I keep an eye on things and try to discourage blooming. Or I think about it, anyway- not sure what to actually do about it. The one thing I do is to not water anything until it is clear they’ve gotten started. I water in the deep winter when there is no risk of waking anything up, and then keep them dry until I’m sure they are already wide awake. 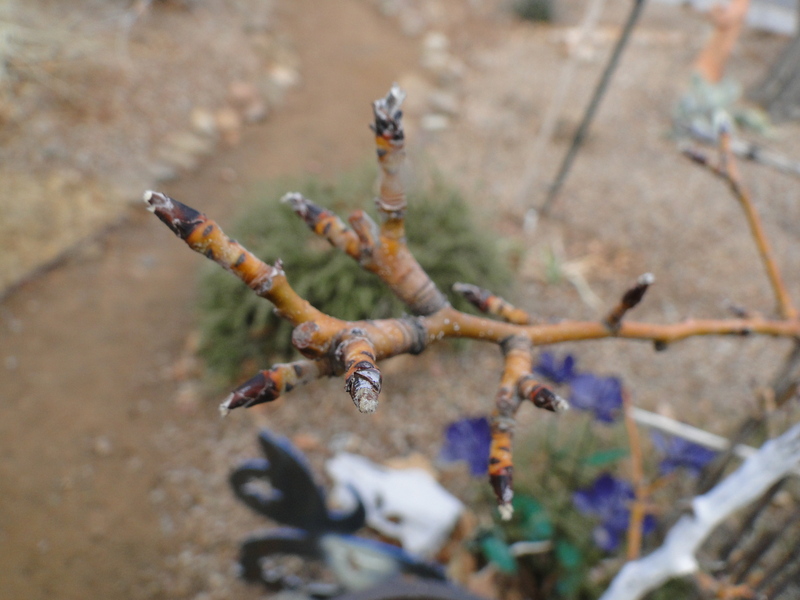 One of the goals of this blog, along with entertaining and edifying its readers, is to have a journal of what is happening in the garden, with dates and everything. I had a print one, with drawings of apple buds in various stages, which has disappeared. Alas. So now I start afresh, and let the cloud preserve my work. 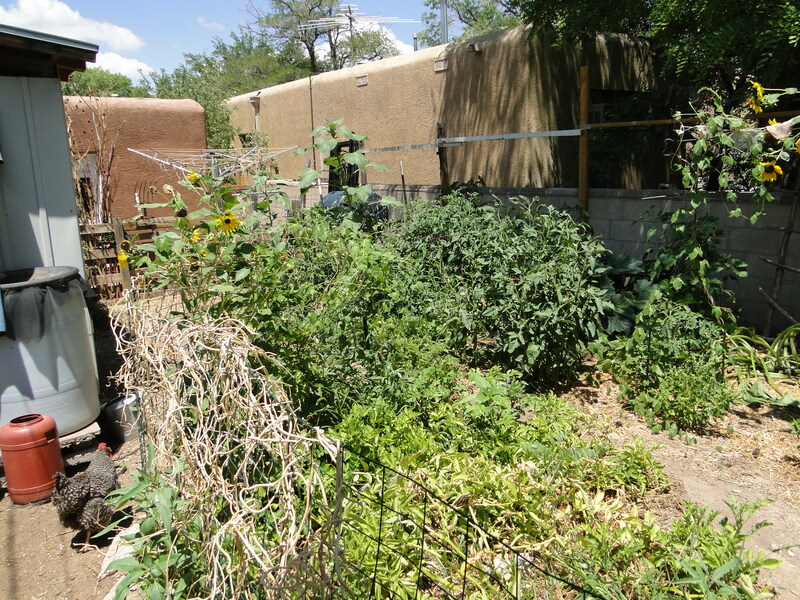 So here is tour of the orchard (which is in three spots in the yard, front, side and back, as well as in two pots). We’ll go bud by bud, with notes where needed. 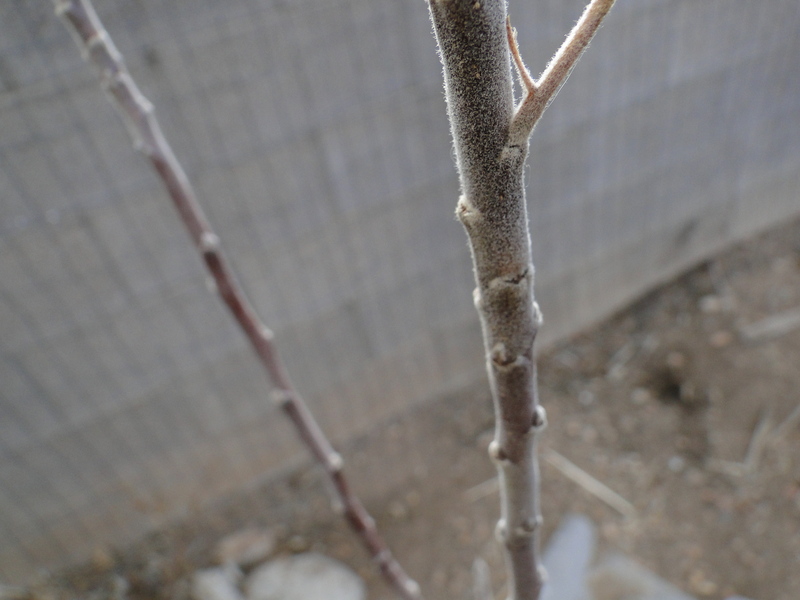 Shinko Pear. The pears are the ones to watch this year, as we moved them from the ground, where they were unhappy, to big pots, where we hope they will be happy. 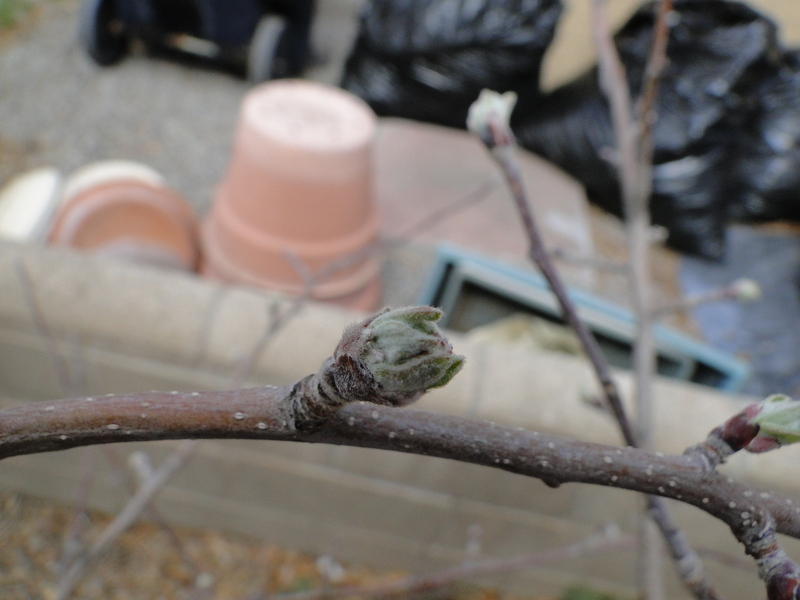 My new plum, replacing the pears where they used to be. It’s not here yet, but should come any day now. Rio Oso Peach. Delicious. Prone to snapping limbs. Niedsvetskanya Apple. Great name. 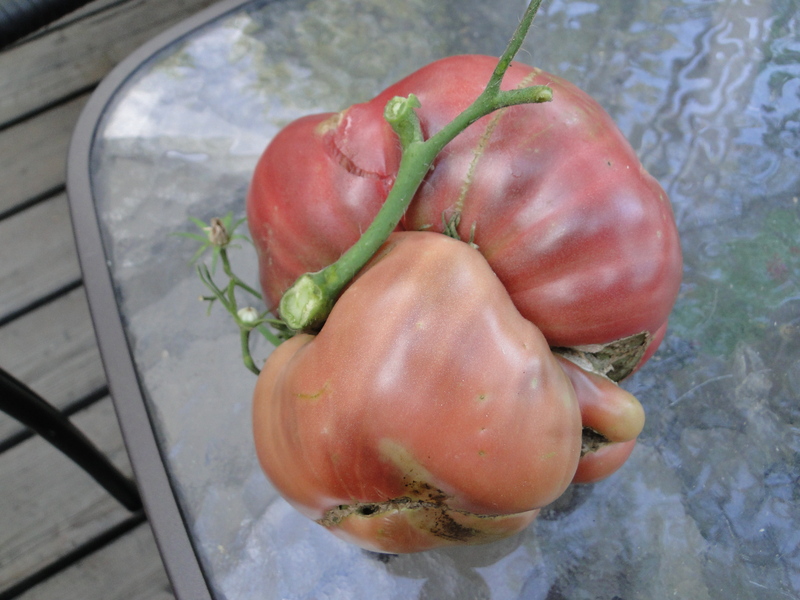 Red flesh when ripe. Tasty and a little bit soft. Cinnamon Spice Apple. In the last two years we’ve eaten one of these, as the others were stolen during the night. It was delicious. Fuji Apple. Prolific and tasty. Arkansas Black. Not so tasty, but adds a valuable bite to cider. Granny Smith. A classic. Usually the first to leaf out. Smokehouse. Hasn’t produced yet. Great name. From Pennsylvania. Orleans Reinette; actually looks the closest to leafing out of any of them. Victoria Limbertwig. Best name of the lot. Except for that Orleans Reinette, no real signs of life. 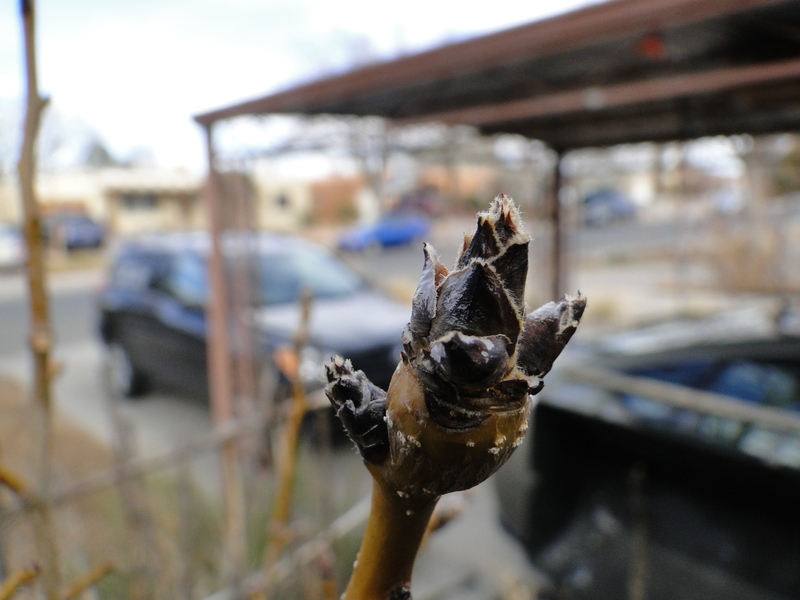 The buds are still small and looking mighty dormant, which is fine. Smash it all together and spread it on good bread, in my case ‘Grandma’s White’ from the bakery down the street. Serve with a cold RC Cola.